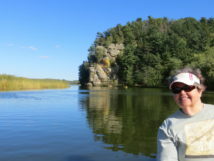 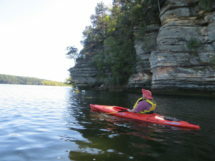 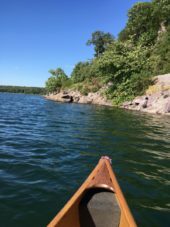 Most residents in Wisconsin have a fond enthusiasm for Devils Lake State Park. 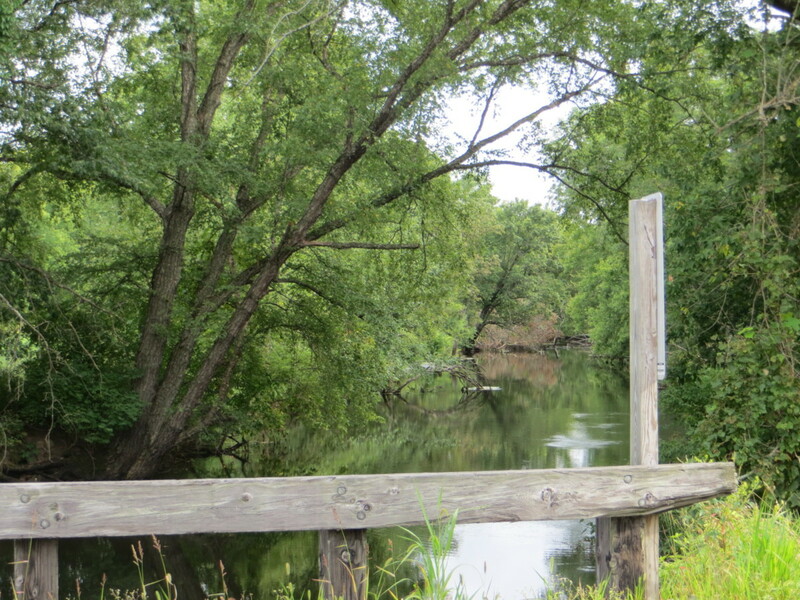 Maybe since we didn’t grow up here in the dairy state we don’t have the same dreamy associations. 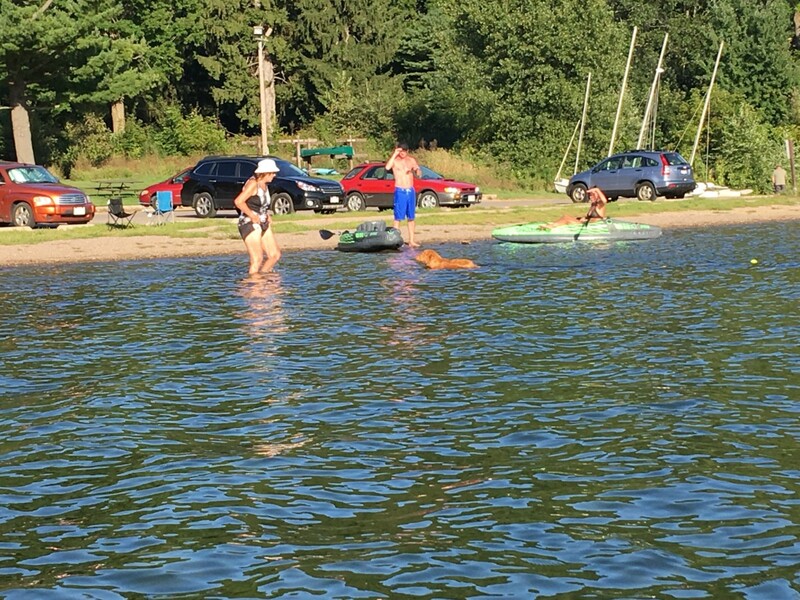 So to start getting to know this area a bit, we decided to paddle the circumference of the lake. 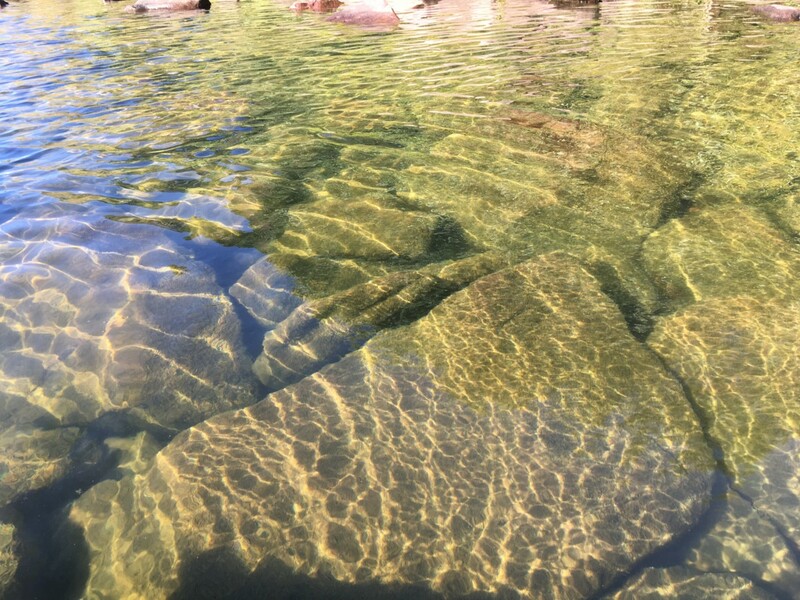 The summer of 2018 was a time of flooding and high water that made many of our lovely rivers inadvisable to be upon. 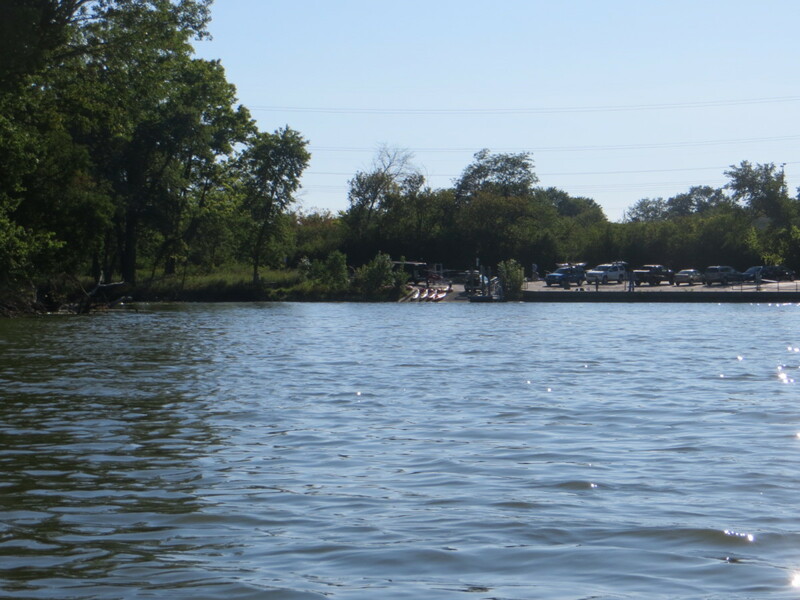 One thing you will love – no gas motor boats are allowed! 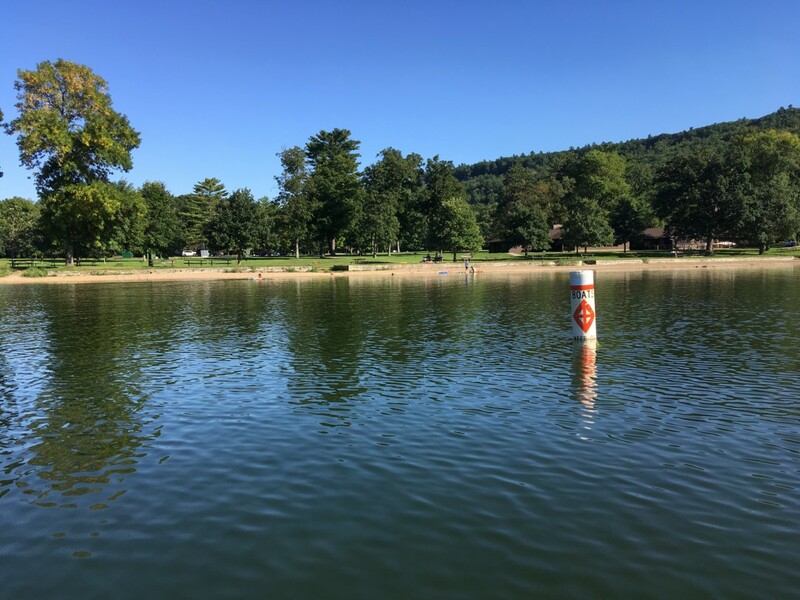 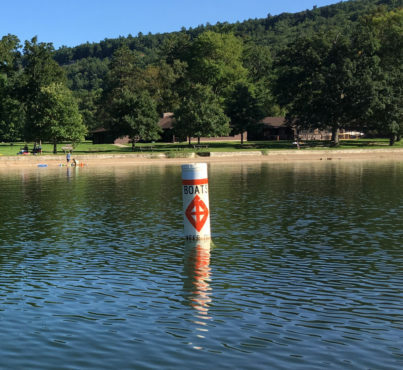 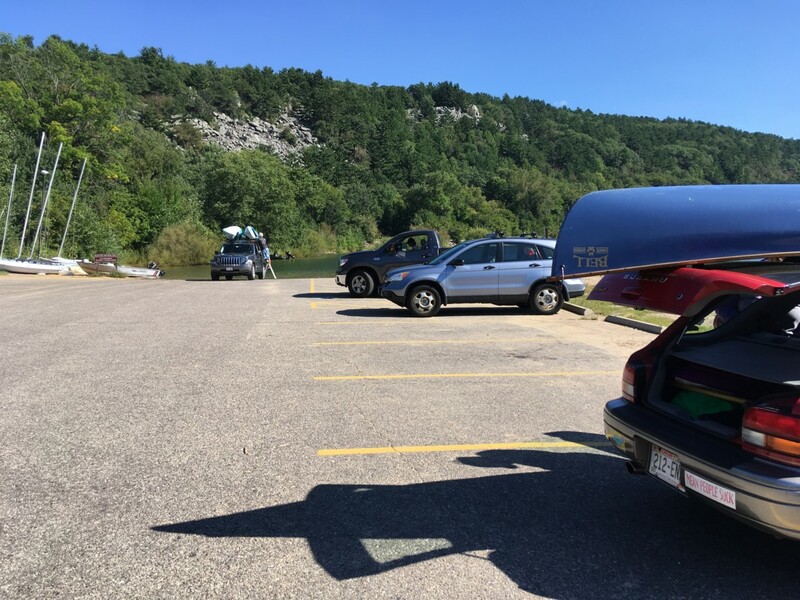 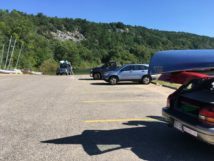 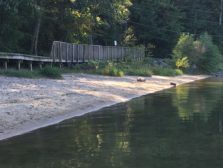 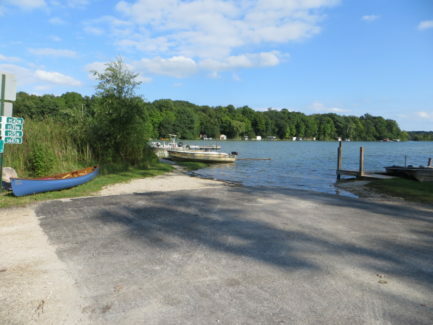 There are two boat ramps marked on the state park map. The signage is pretty bad for the south boat landing. 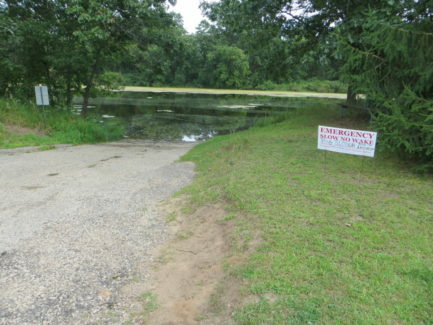 If that is where you want to launch, pull in where the sign says “pet swim area” because the pet swim area and the boat launch are one and the same. 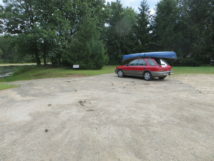 There is parking across the street. 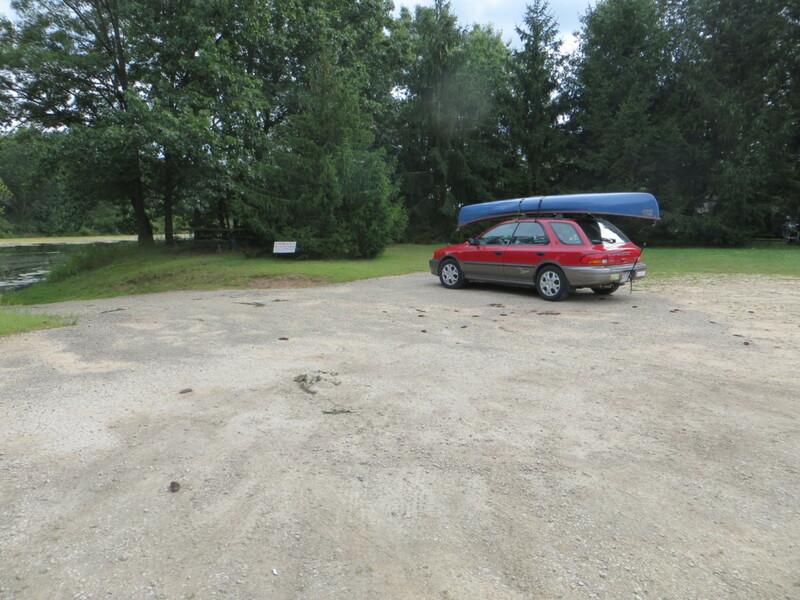 The north boat landing has great parking and is easier to find. 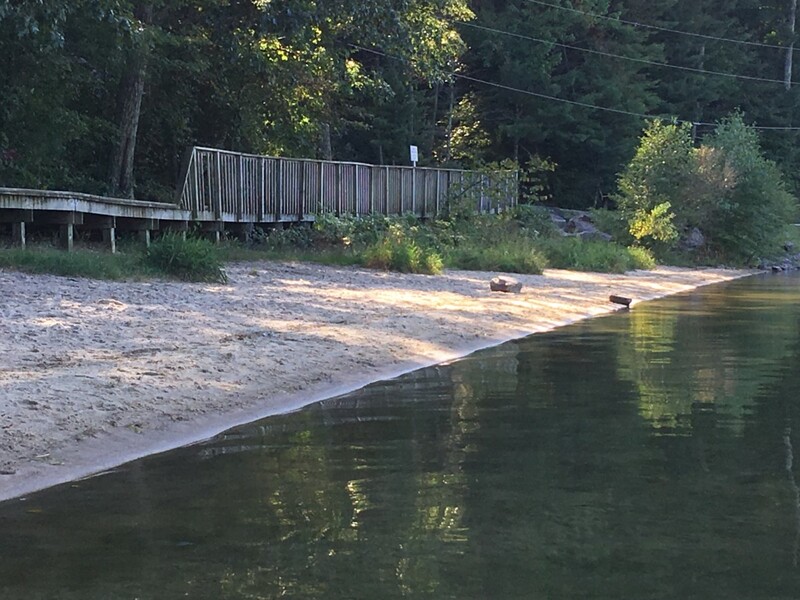 Once there, your choice is to launch from a nice ramp or from a sandy beach. 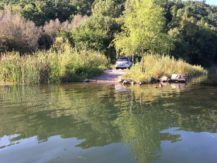 We put in from the beach and took out in the official boat ramp just to try it out. 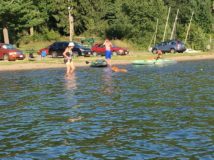 You do have to navigate around some sandbars to disembark. 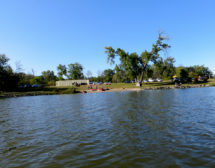 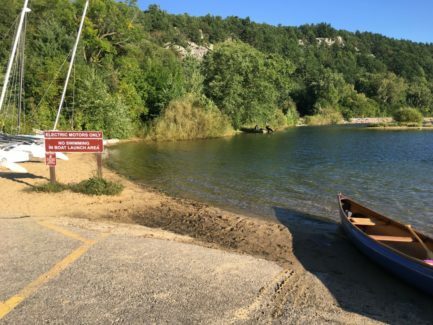 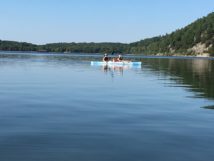 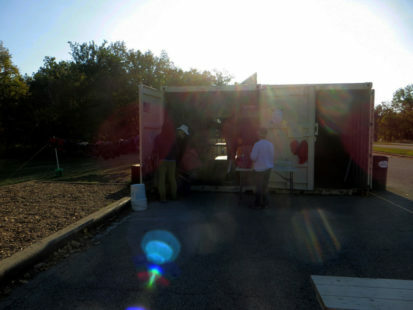 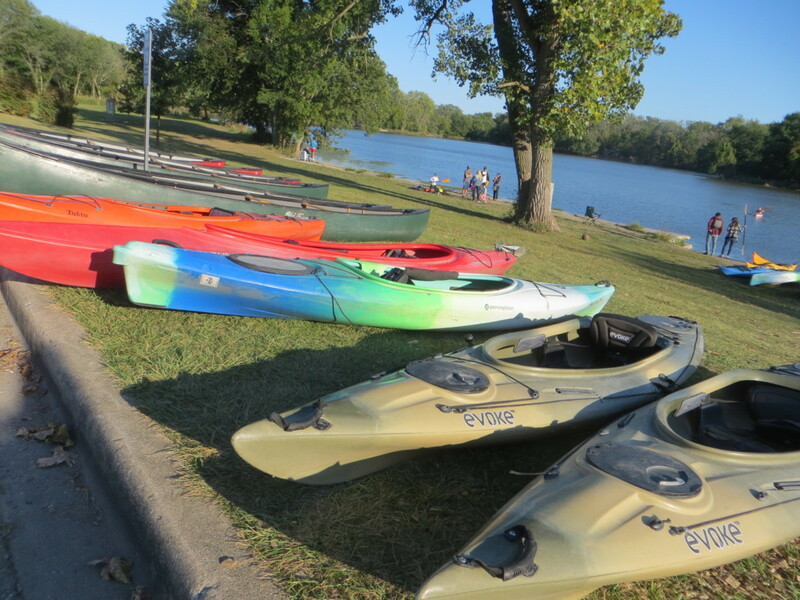 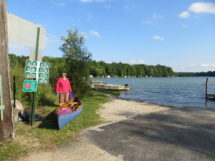 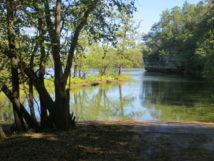 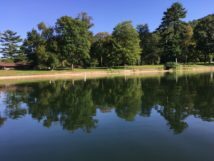 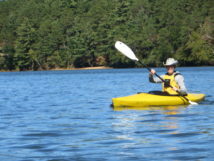 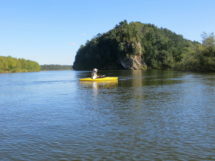 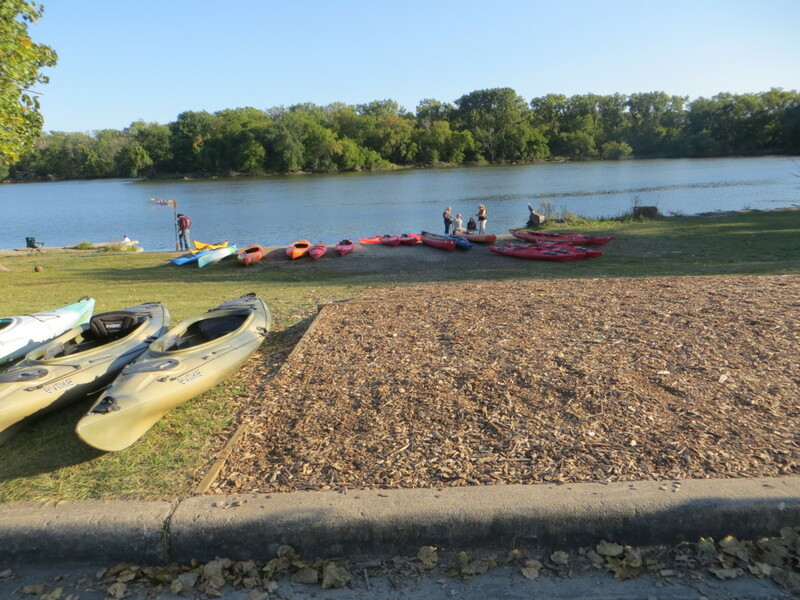 At this location, canoes, kayaks and small sailboats are available for rent. 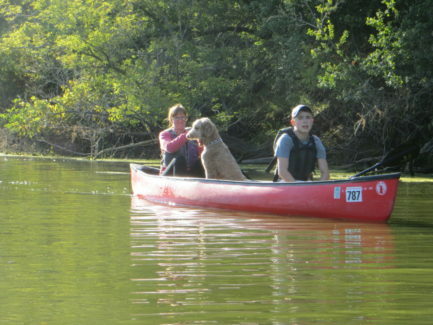 The paddle is about 3 miles. Watch out for rocks along the shore. 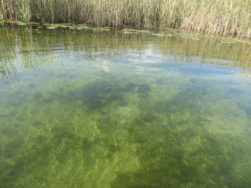 Luckily they are easy to to see because the lake is quite clear, and the bottom is clearly visible along the shallow edges. 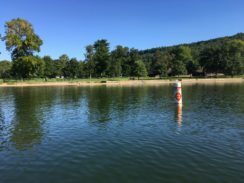 The maximum depth is 47 feet. 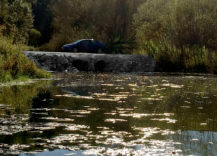 The lake is a seepage lake, situated in a deep chasm with no visible inlet or outlet; it has no spring and no feeding river. 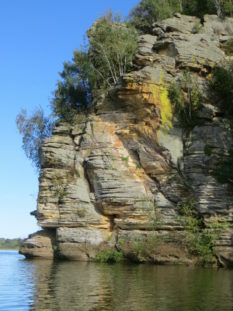 The sunny side has rocks exposed. 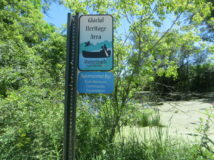 There are trails around the lake to walk – some of which are segments of the Ice Age Trail which follows the where the glaciers stopped. 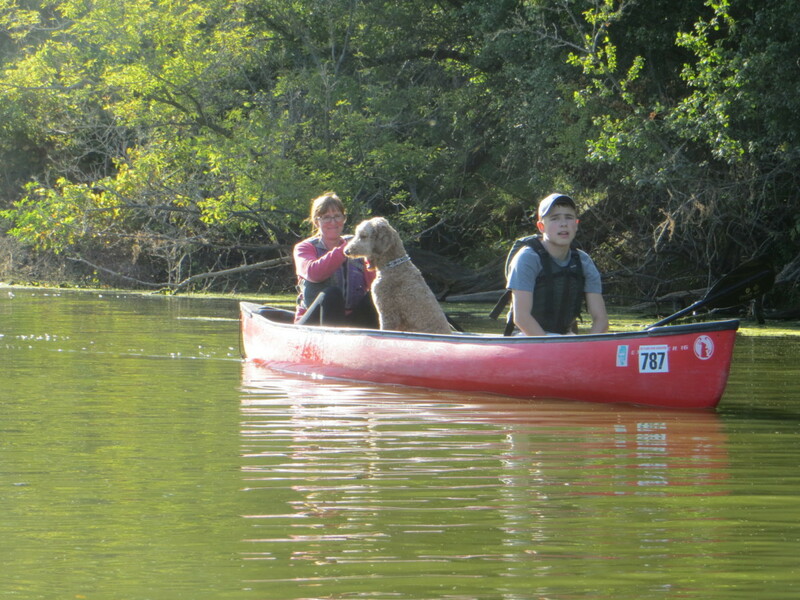 There were a few other paddlers and many dogs, some riding in the kayaks. 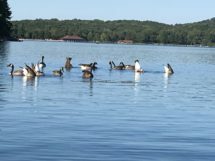 We saw a gaggle of geese hunting for fish. 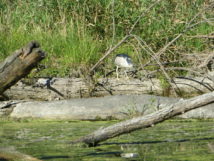 It was fun to watch them bloop under, butts up! 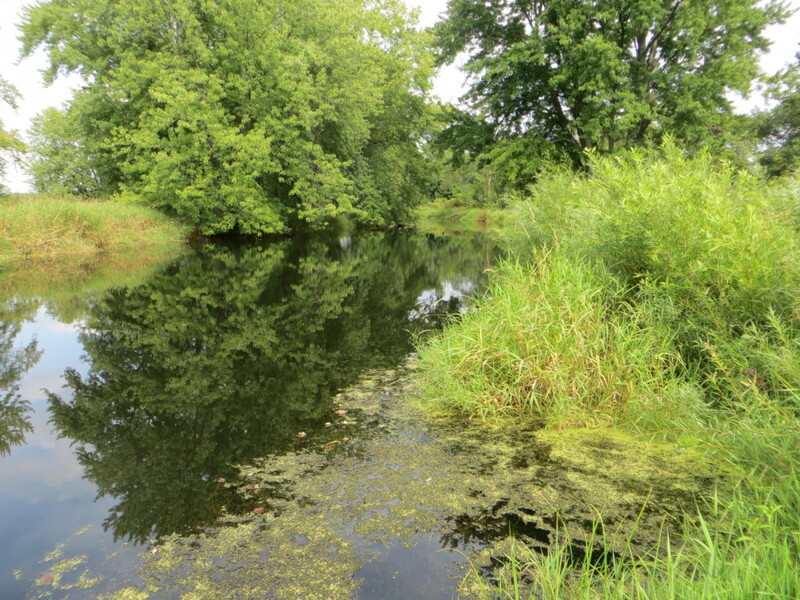 There is a little stream and the water was high enough to explore but it ends in a culvert. 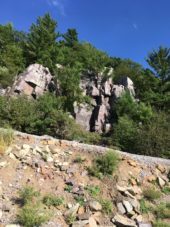 At this point, we don’t know where that goes. 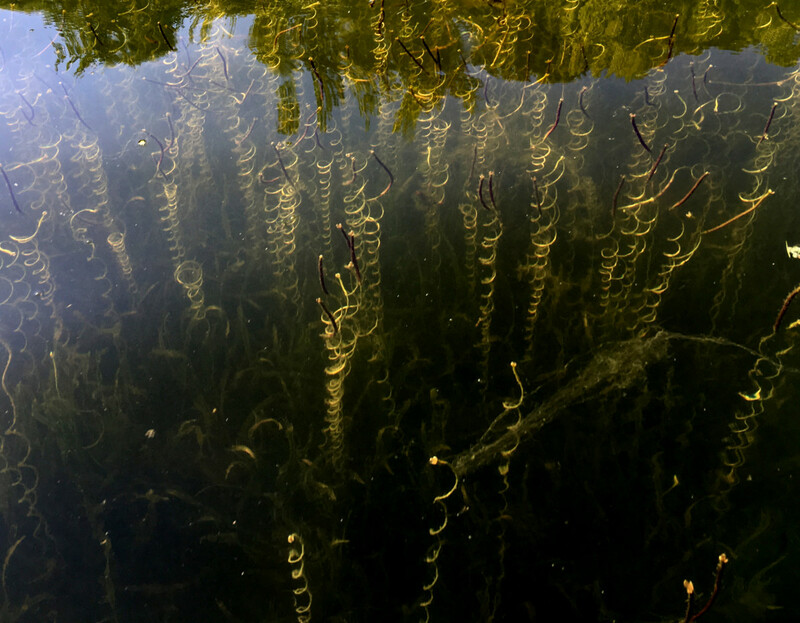 There is some vegetation in the water. 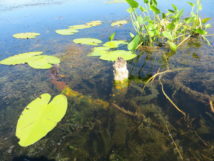 Some seemed healthy and some seemed invasive. 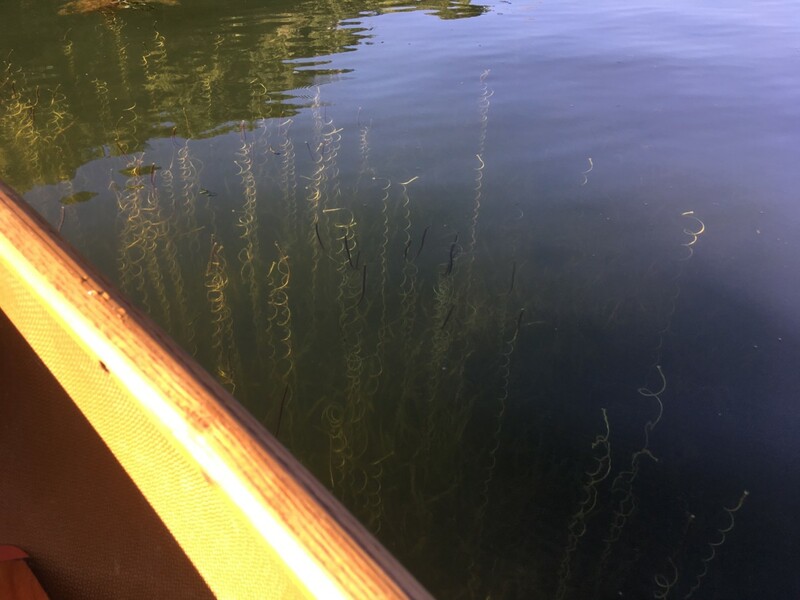 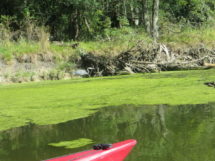 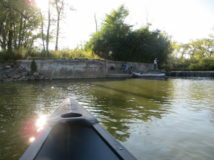 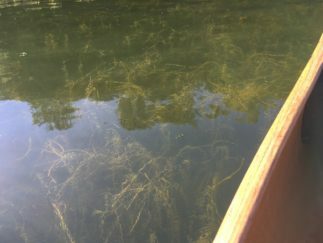 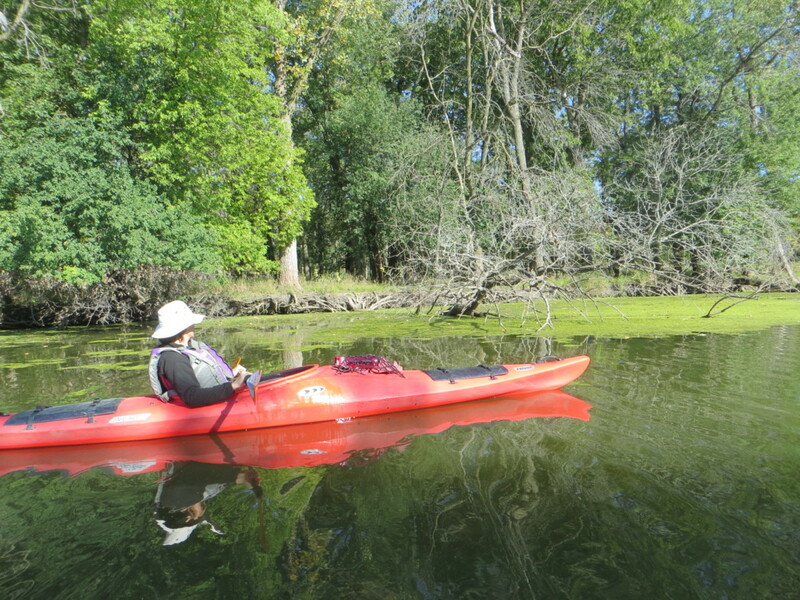 Very little algae at this point and quite clear compared to other waterways we paddle. 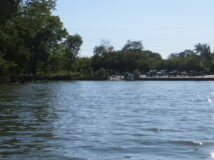 On the Southeast side of the lake there is a row of houses / cottages. These properties were grandfathered in when the WI law prevented new developments at Devils Lake. 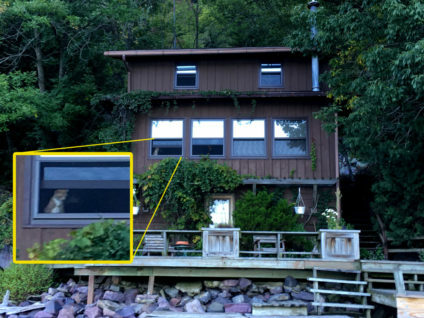 Mary had a little conversation with a cat in one of the windows. 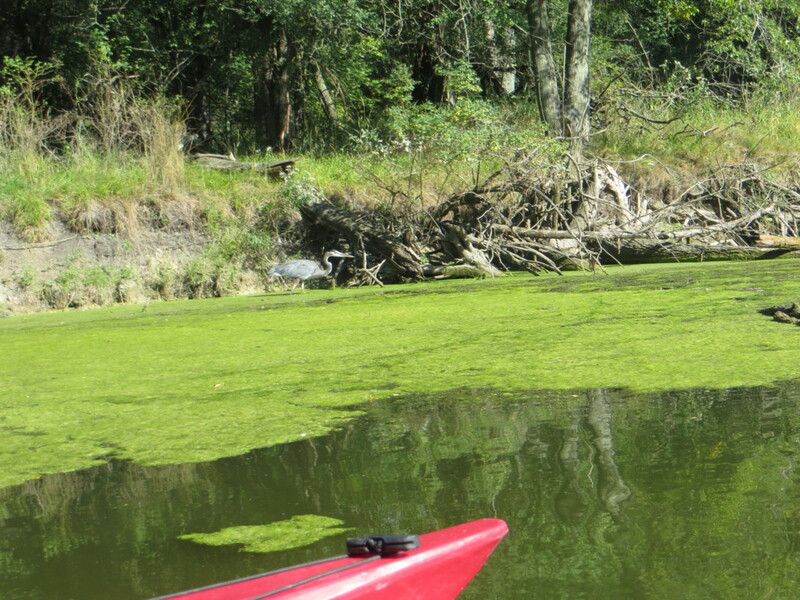 There were rocks on the “shady” side of the lake that had a definite dividing line of mossed vs not-mossed rocks. 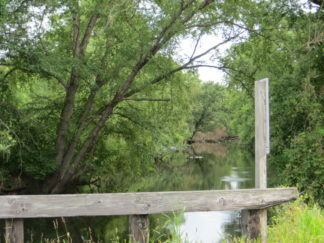 Probably the water level was much higher a week or so ago. 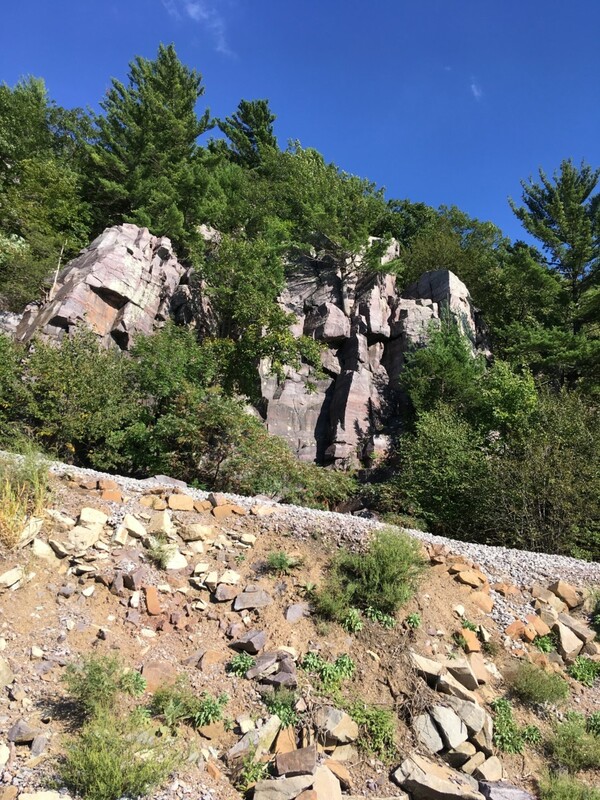 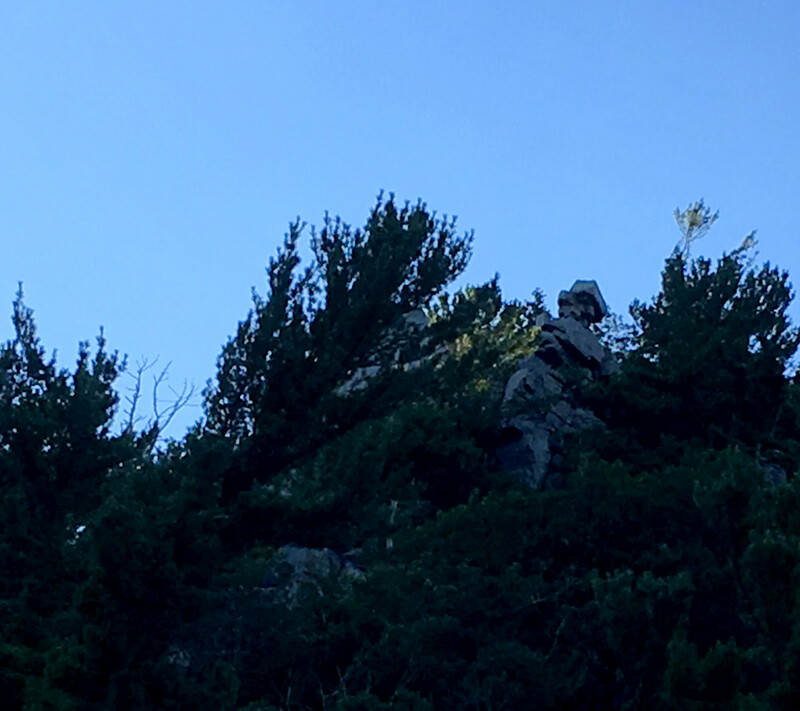 Also on this side is “Balanced Rock” which looked really small from where we were sitting, but it is a hiking destination for many. We used the boat ramp to exit. 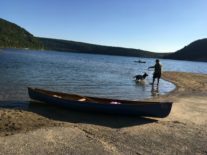 Had a nice chat with this guy and his dog who relentlessly fetches. 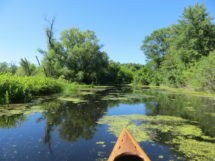 All in all, it was great exercise on one of the last beautiful sunny days of the summer and a nice pick of waterway to canoe once. 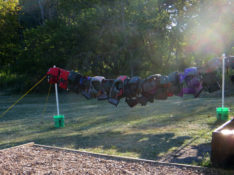 Why only once? 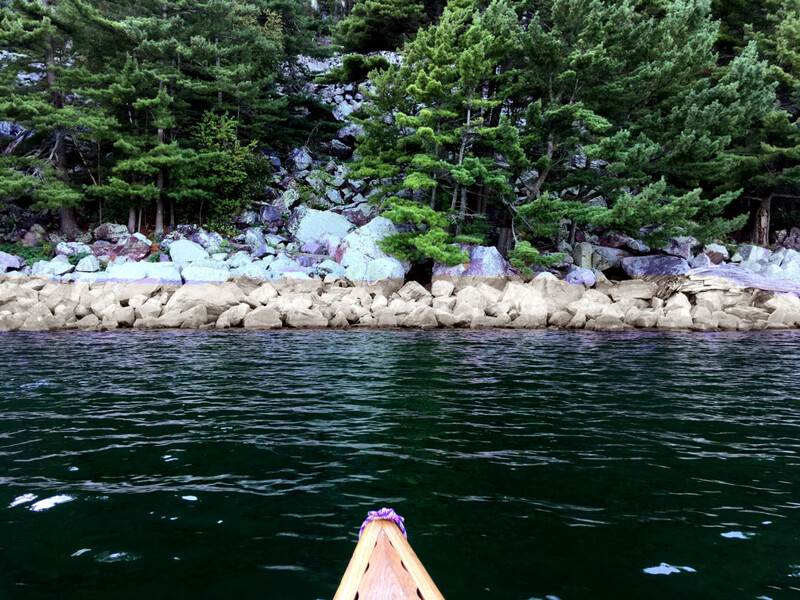 Because we do like more of the feeling of “going somewhere” and uncovering what is around the next bend. 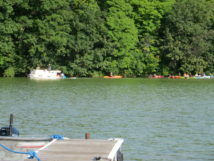 On a lake “it is what it is” – you can see pretty much all of it from the launch. 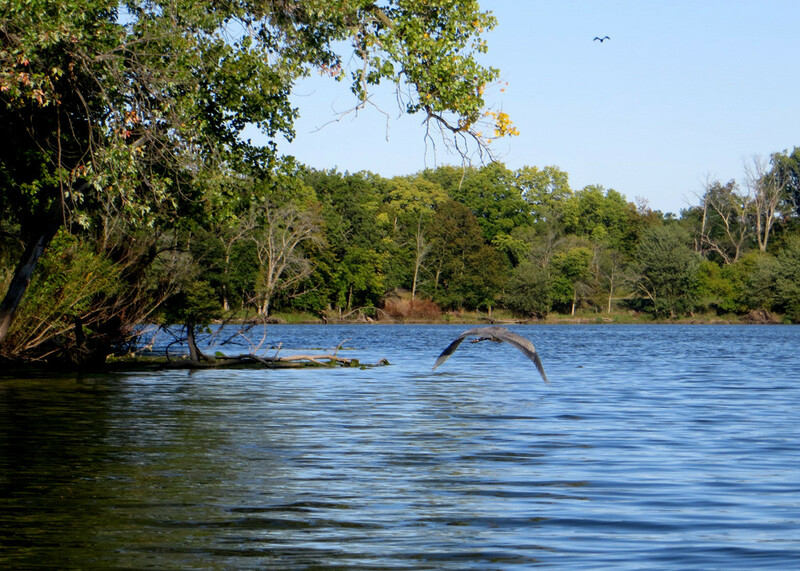 This lake is probably quite pretty, but we really couldn’t see much of the water surface. 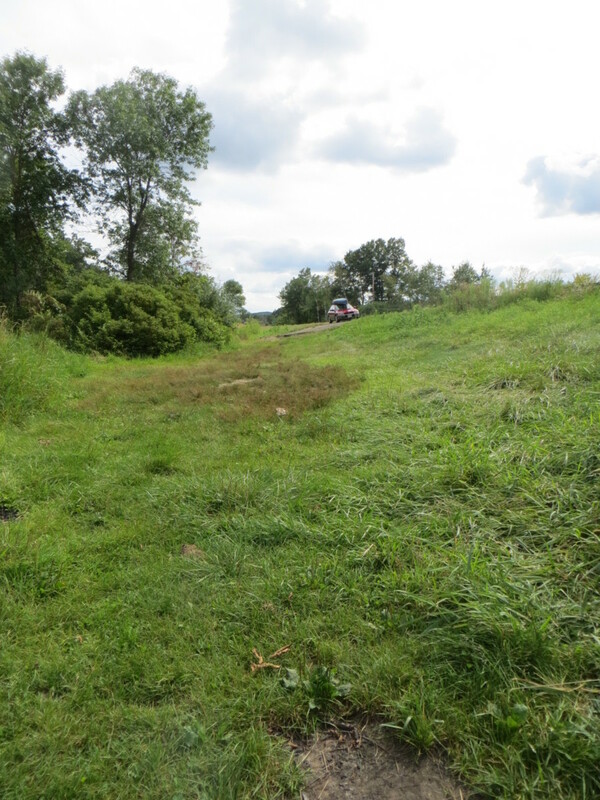 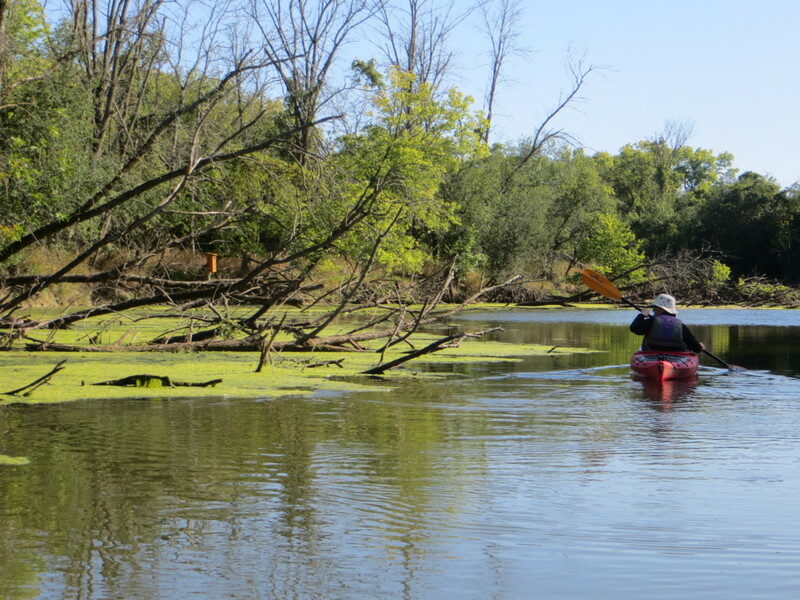 We got to it too late in the season – it was just packed with vegetation. The canoe did ok in this thick plant material, but kayak paddles would probably get tangled due to the different pattern of paddle strokes. 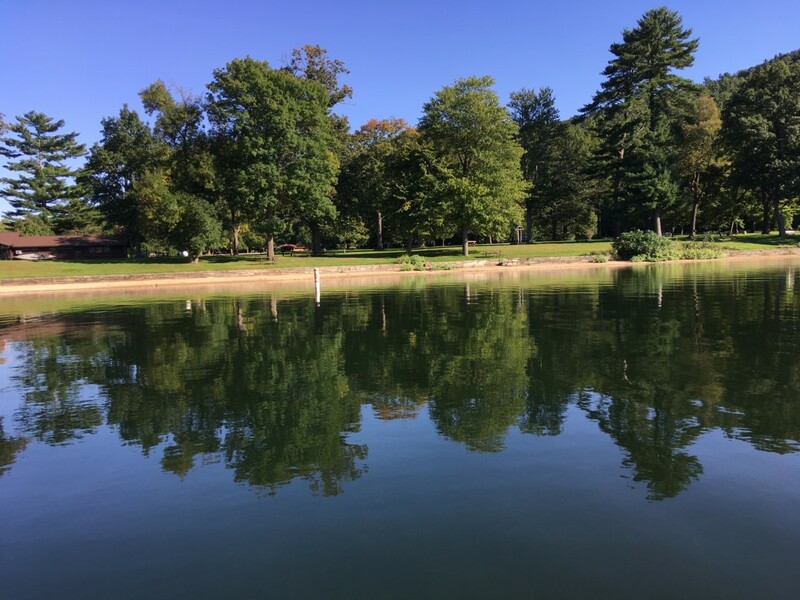 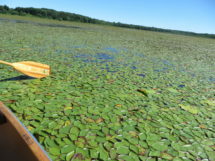 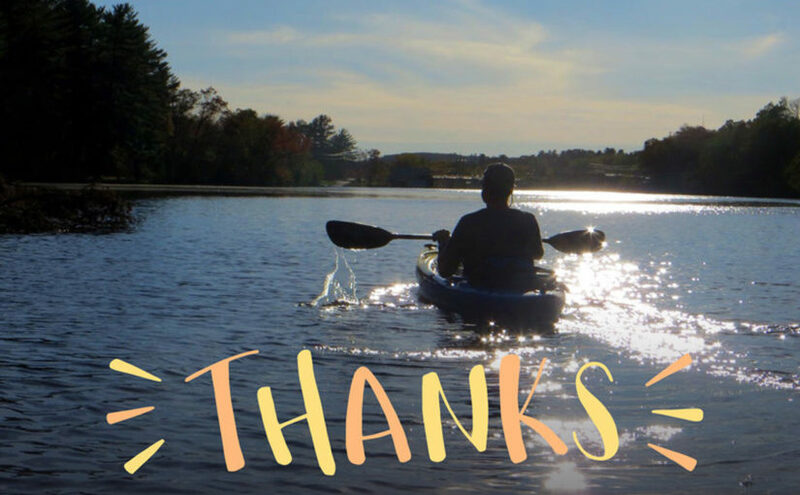 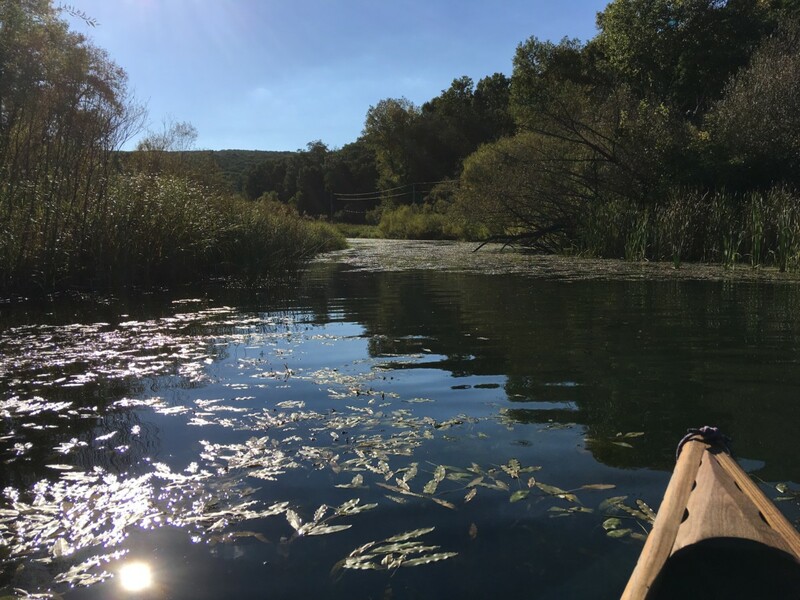 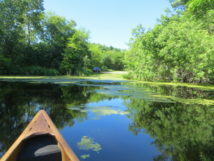 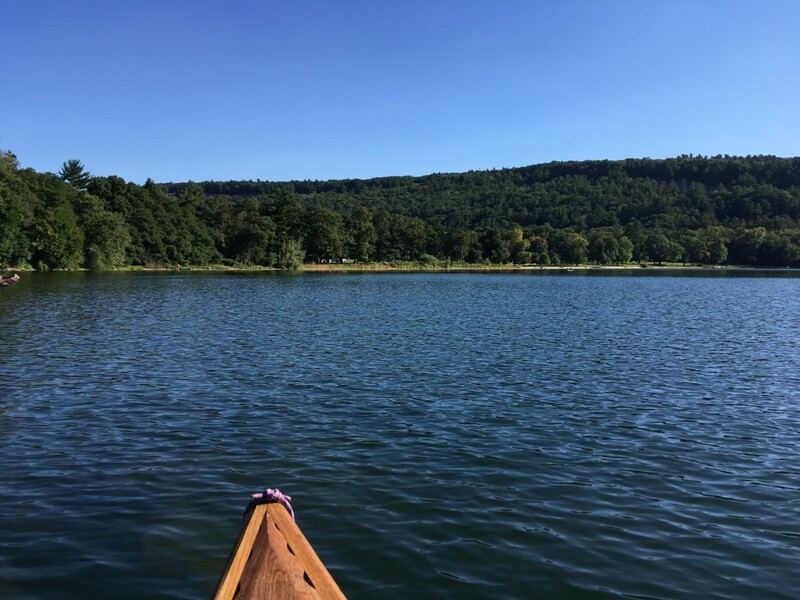 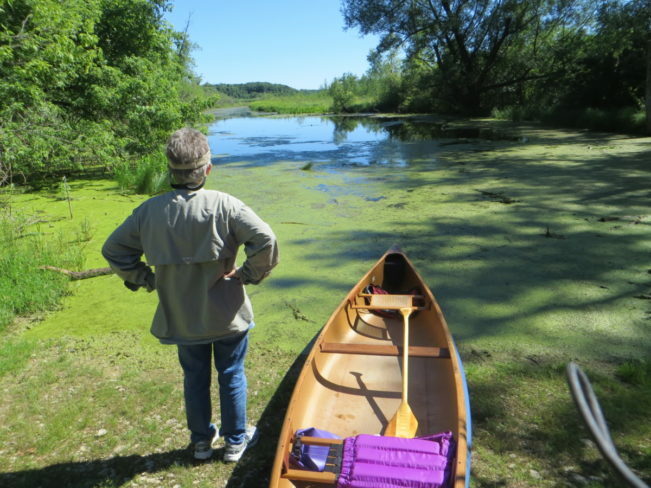 We heard about Red Cedar Lake in one of the paddling books, and it sounded idyllic; we guess they must have gone in the spring. 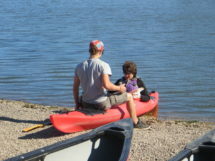 We probably will not try again this year. 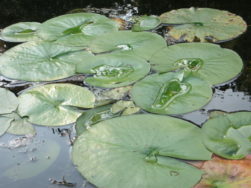 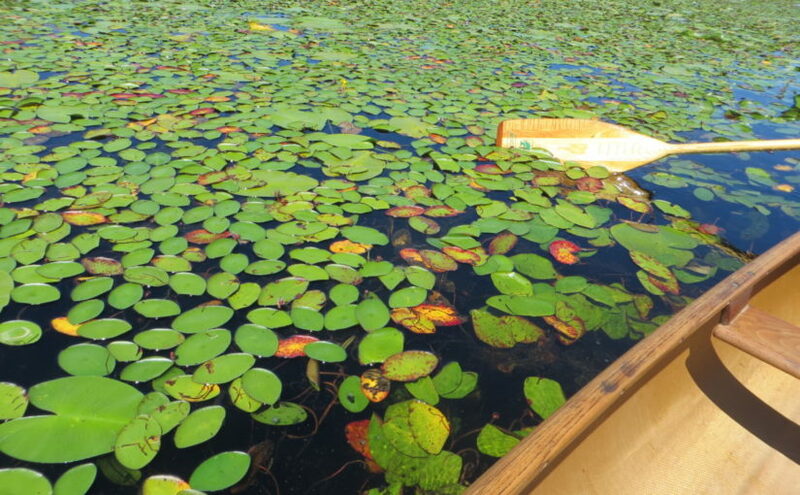 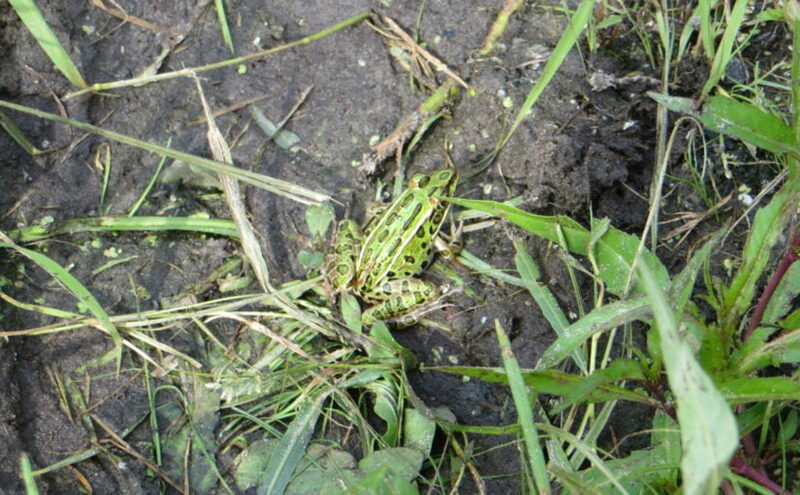 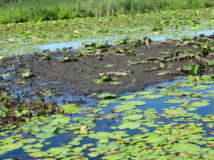 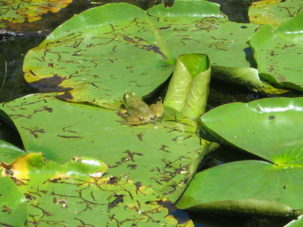 It wasn’t a total fail – there were tons and tons of frogs on the lily pads! 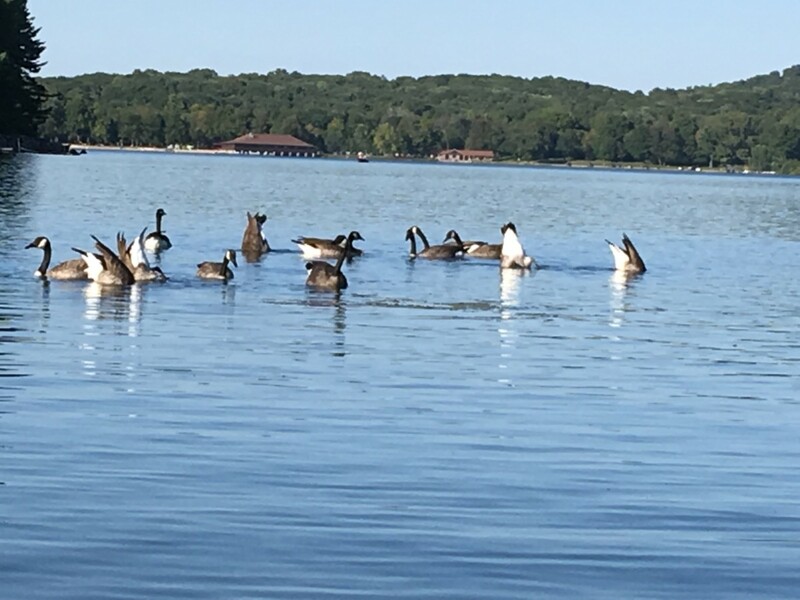 We startled them as we floated passed, and we heard “squeak-splash” continuously as they blip-blip-blipped back into the water. 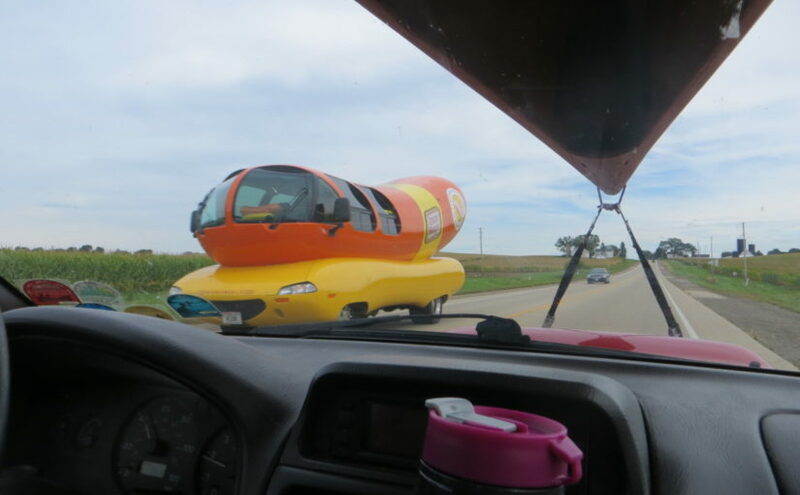 It was impossible not to laugh. 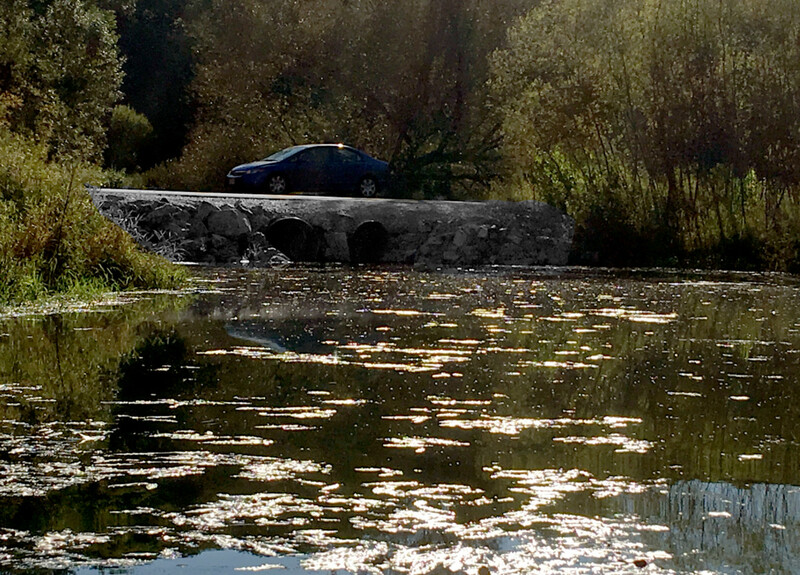 No motors of any kind are allowed(!) 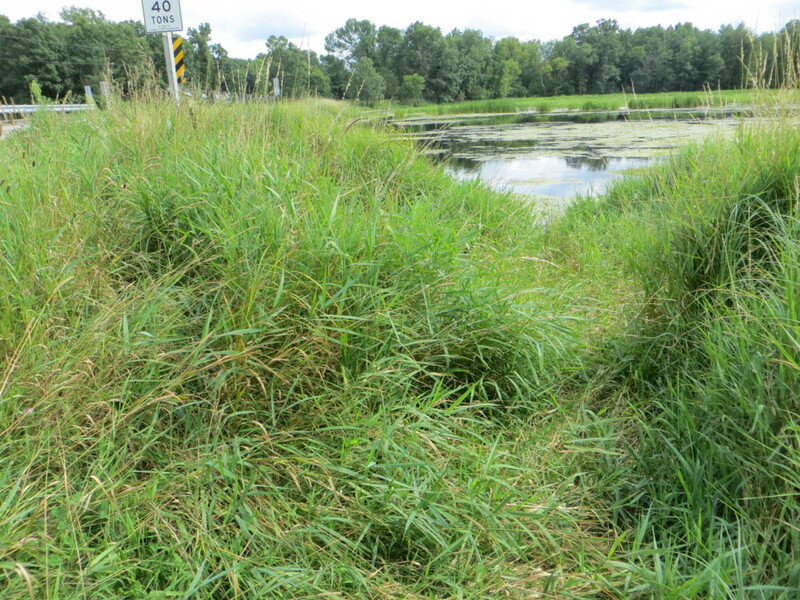 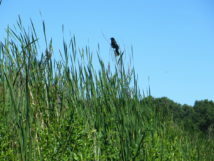 and, if you are a forager, there are a lot of cattails to harvest. 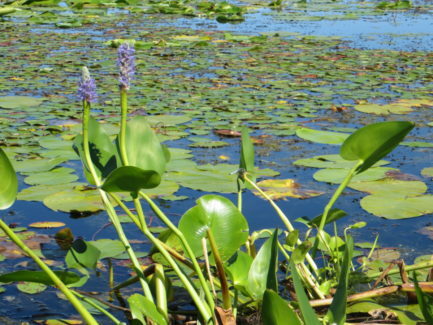 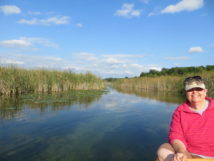 Did you know that almost every part of the cattail is edible at some point in the year? We did take two to turn into a ‘barbecue’ but didn’t use them soon enough. 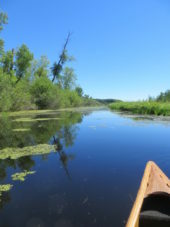 What we liked least were the gunshots as we were unloading the canoe. 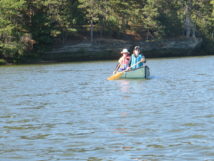 We were relieved not to hear any shooting while we were on the water. 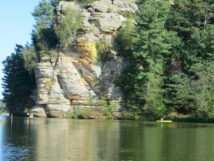 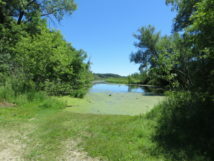 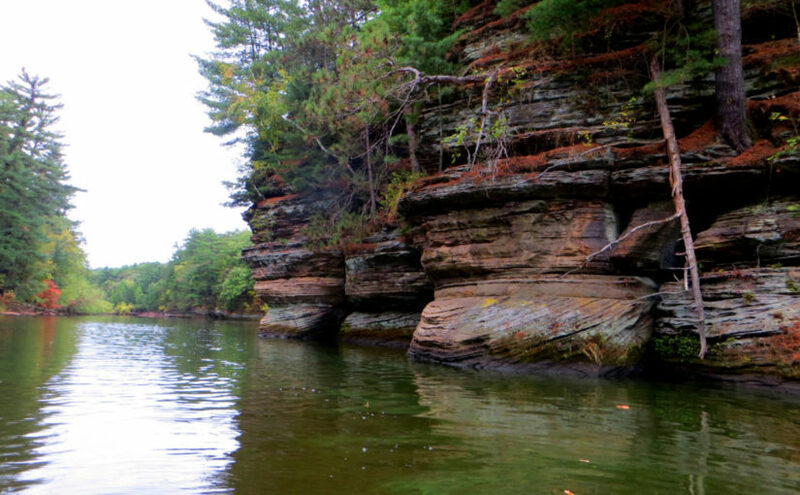 Red Cedar Lake is a 370 acre “water seepage” lake located in the town of Oakland which is just east of Cambridge, WI. 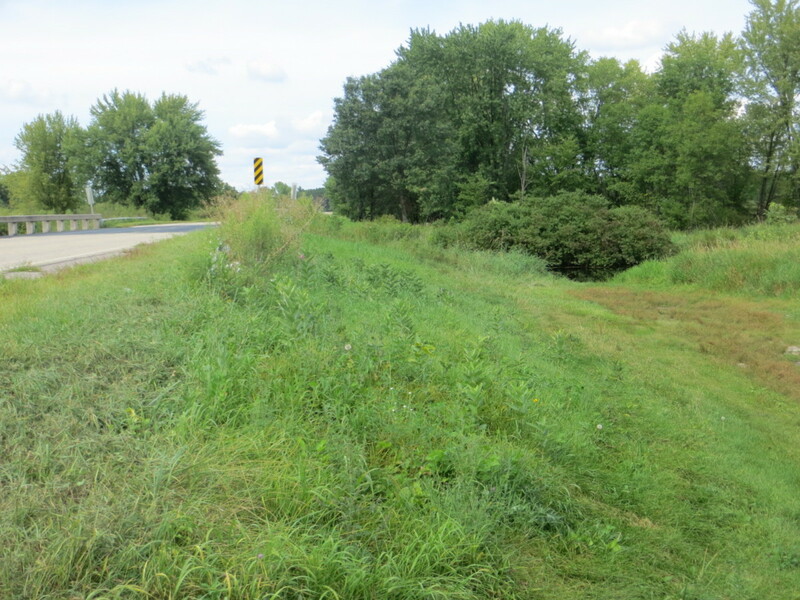 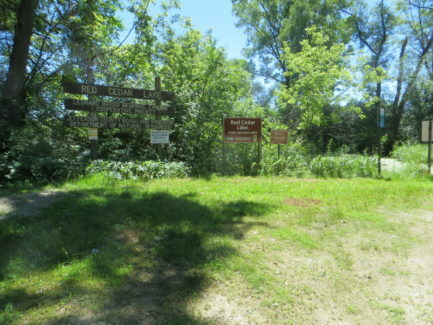 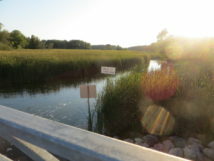 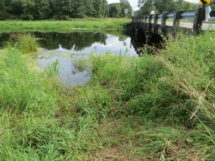 (Turn onto Brosig Lane from US-12) For a State Natural Area, the entrance to Leonard Brosig memorial landing is not at all well-marked; we must have passed it by 100 times and never saw it. 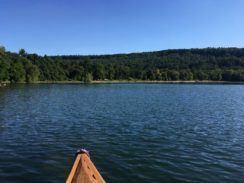 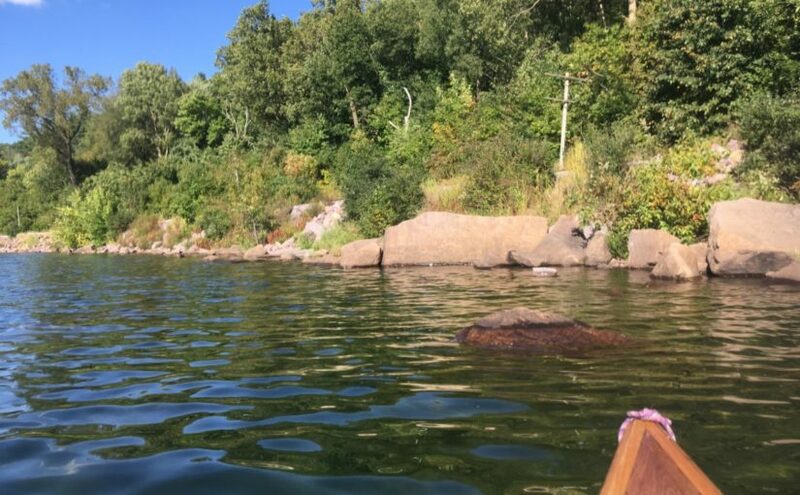 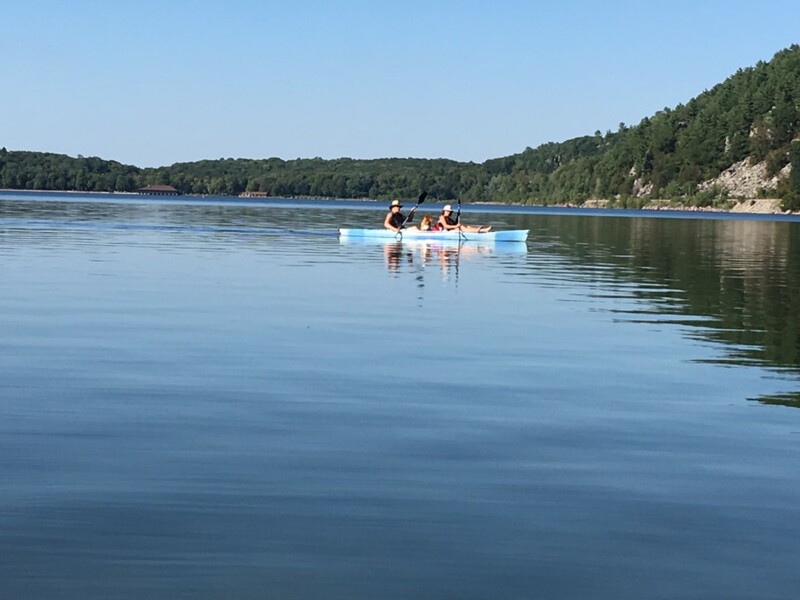 We couldn’t paddle the route we planned, but there is an island in the middle of the lake that we set as a destination and circumnavigated it. 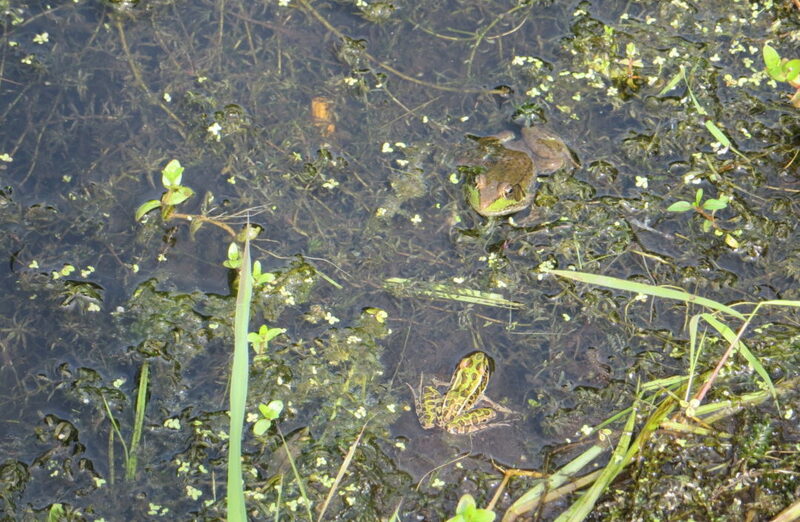 Frogs galore, great blue heron, red wing blackbird, saw yellow-headed blackbird which we see less frequently on WI waterways. 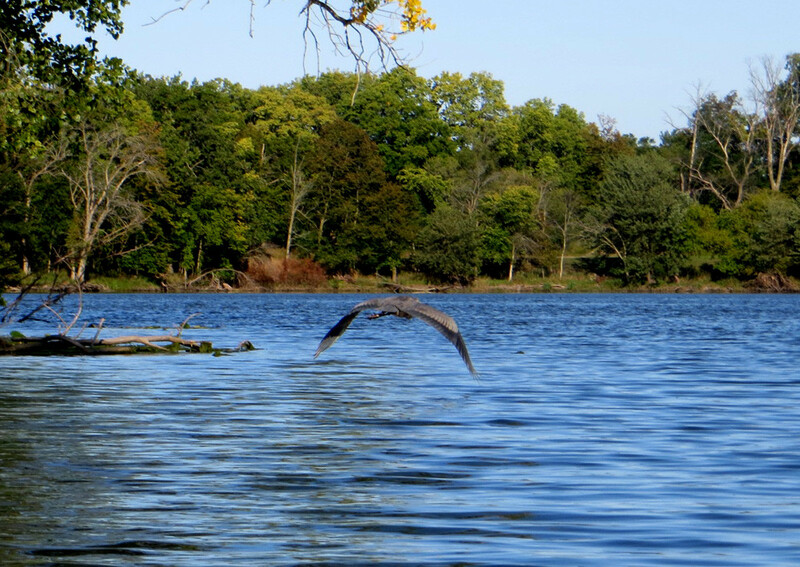 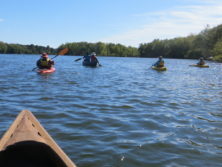 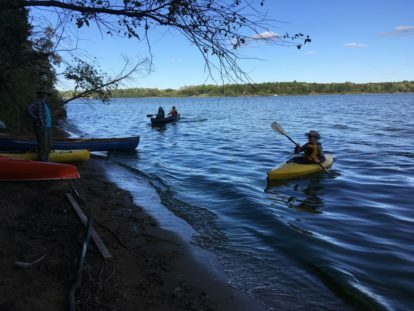 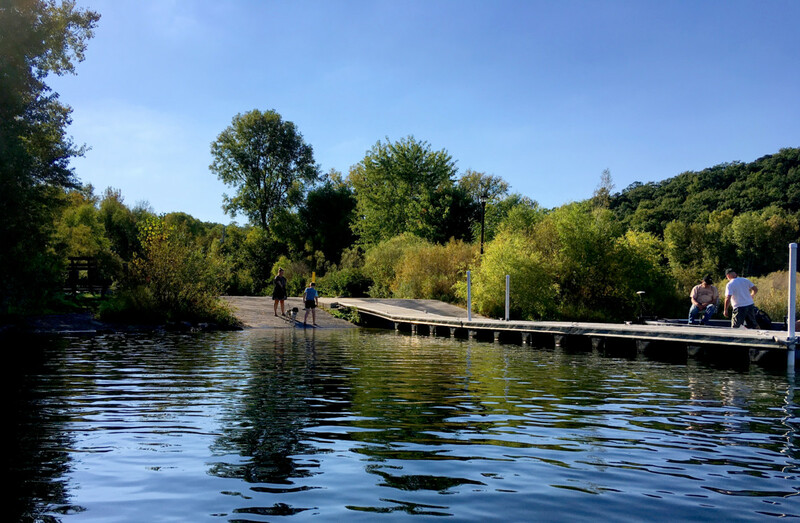 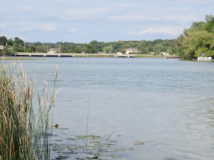 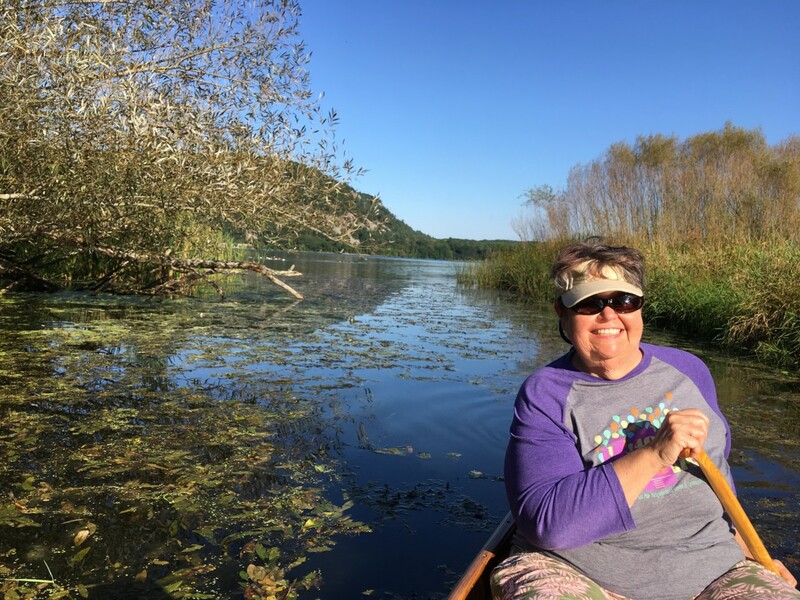 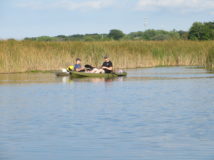 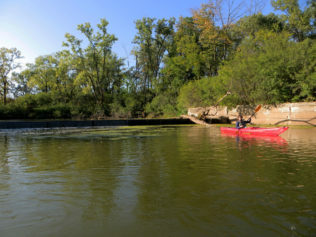 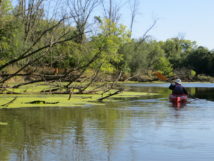 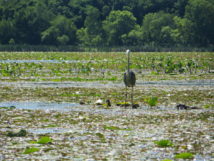 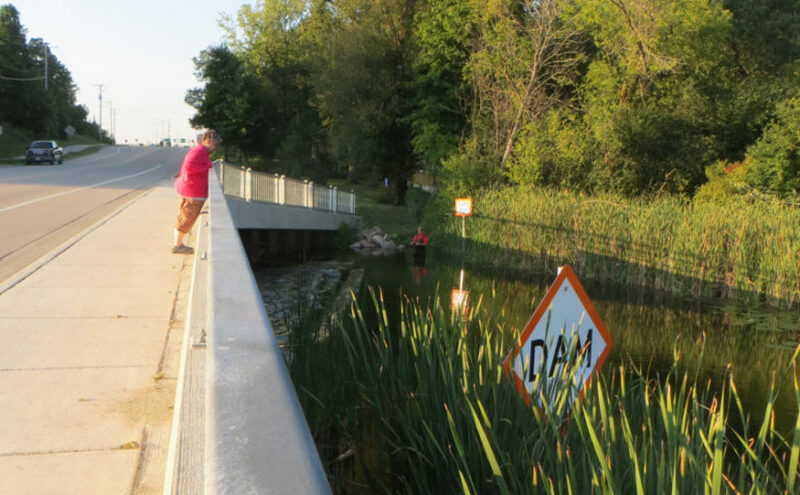 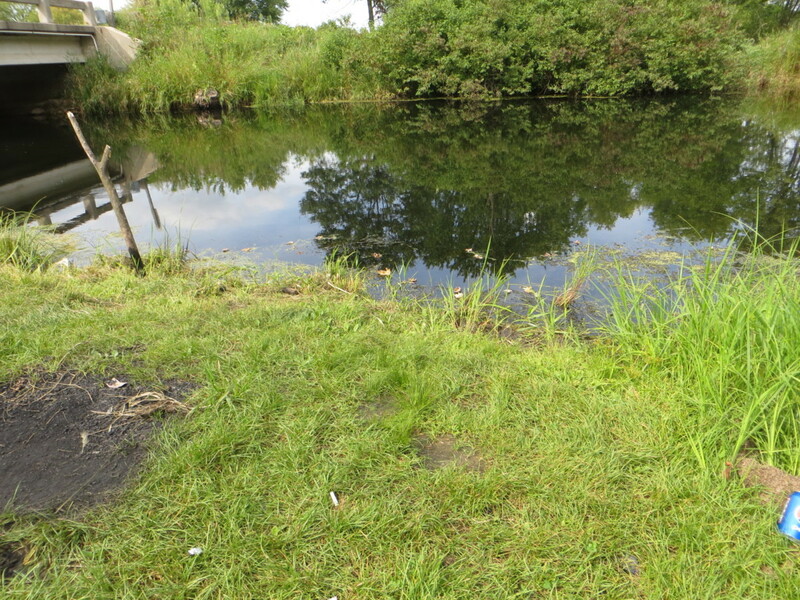 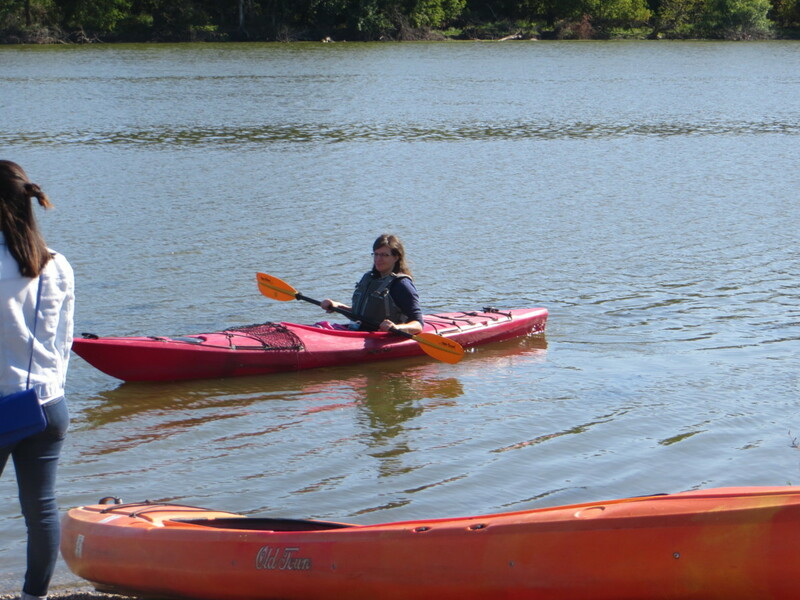 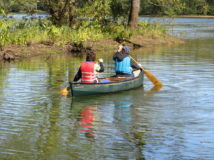 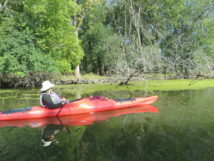 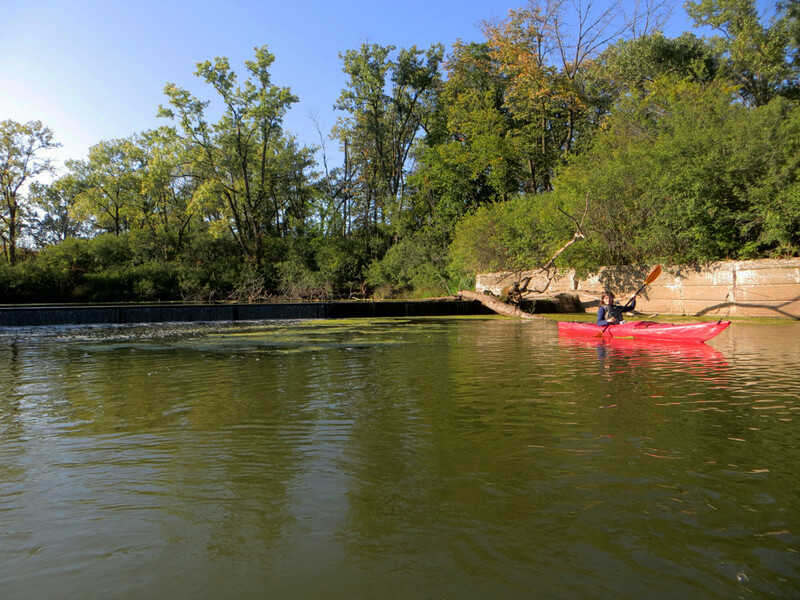 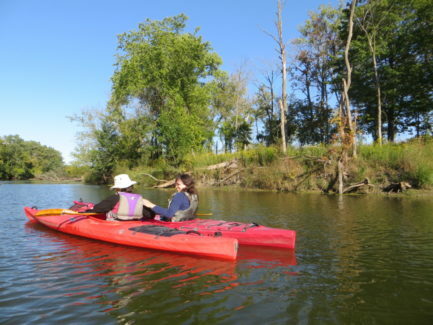 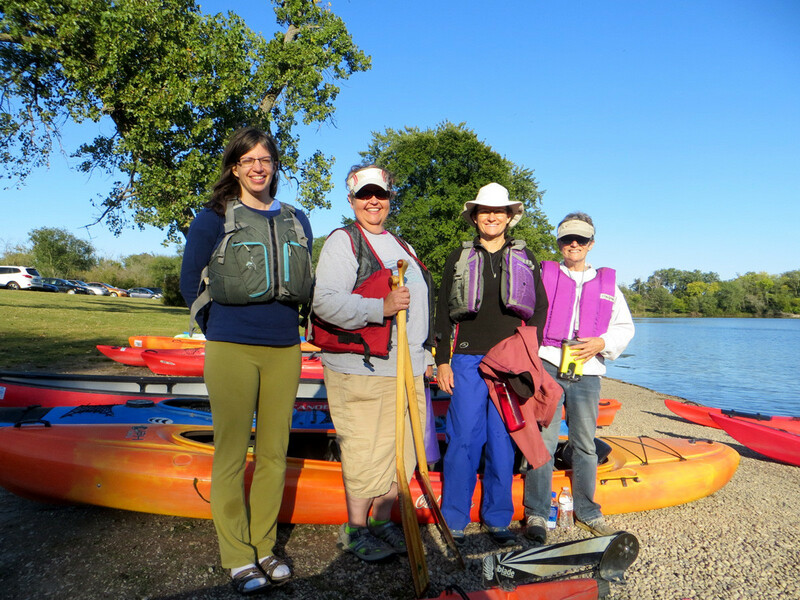 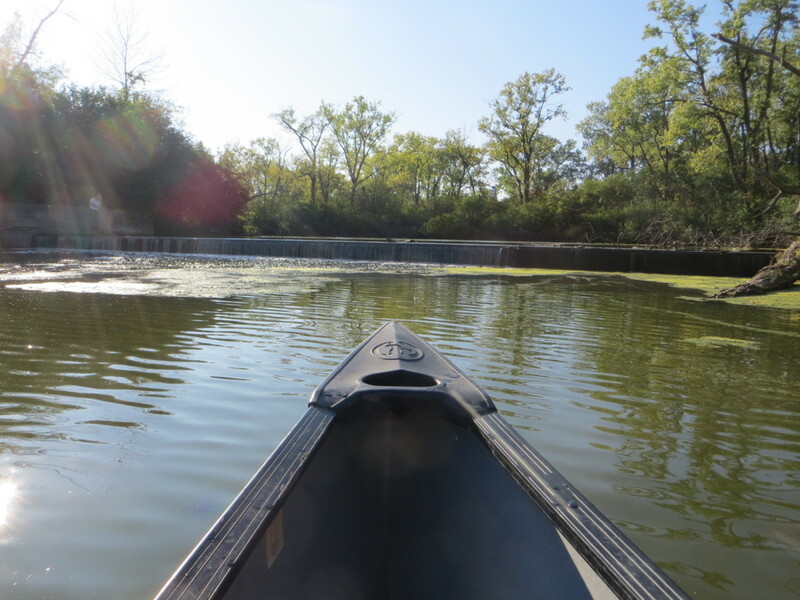 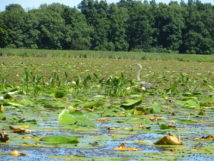 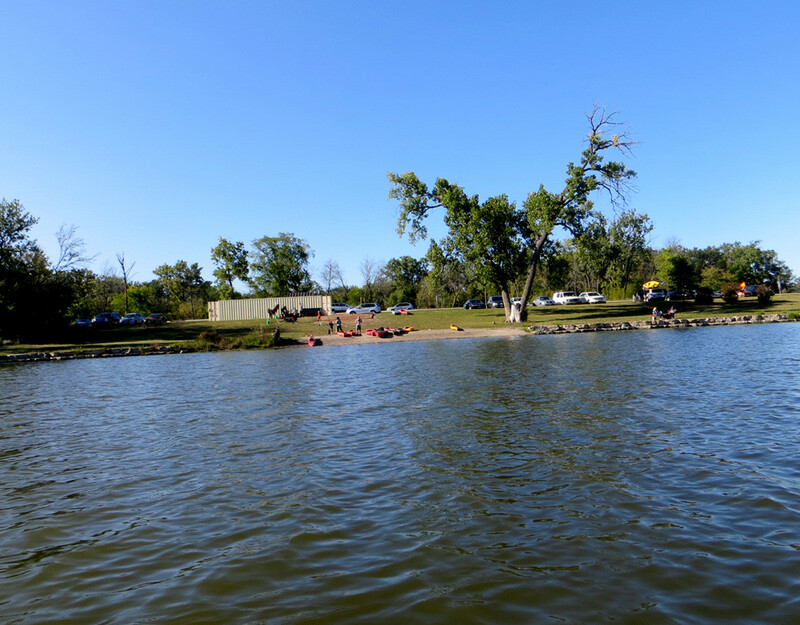 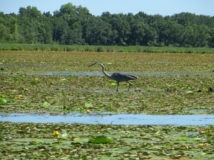 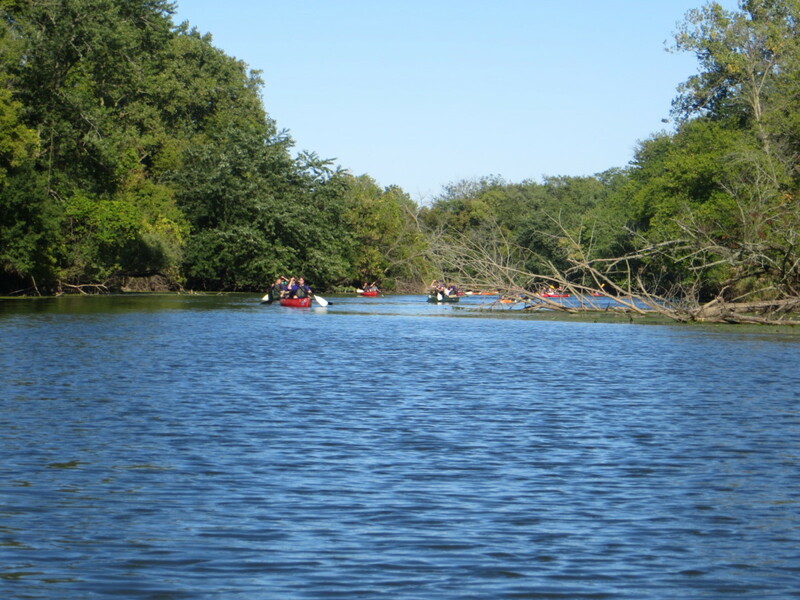 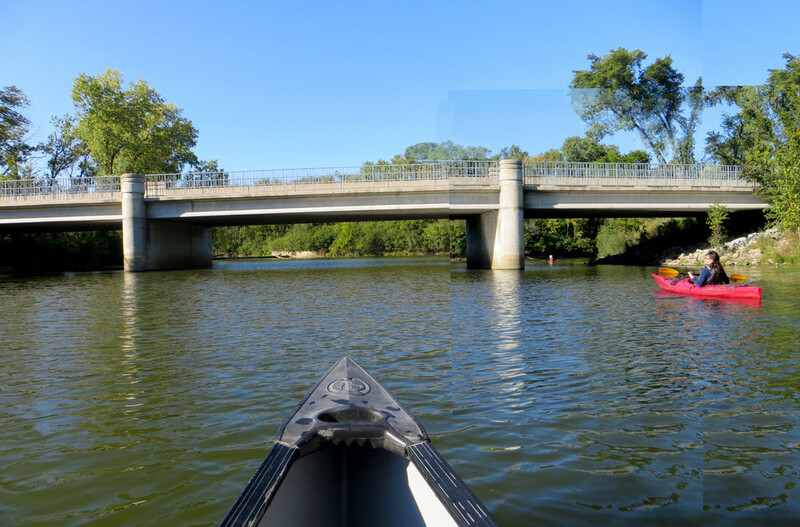 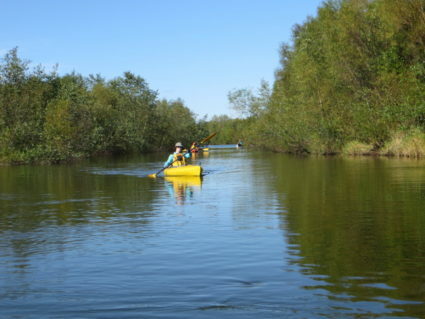 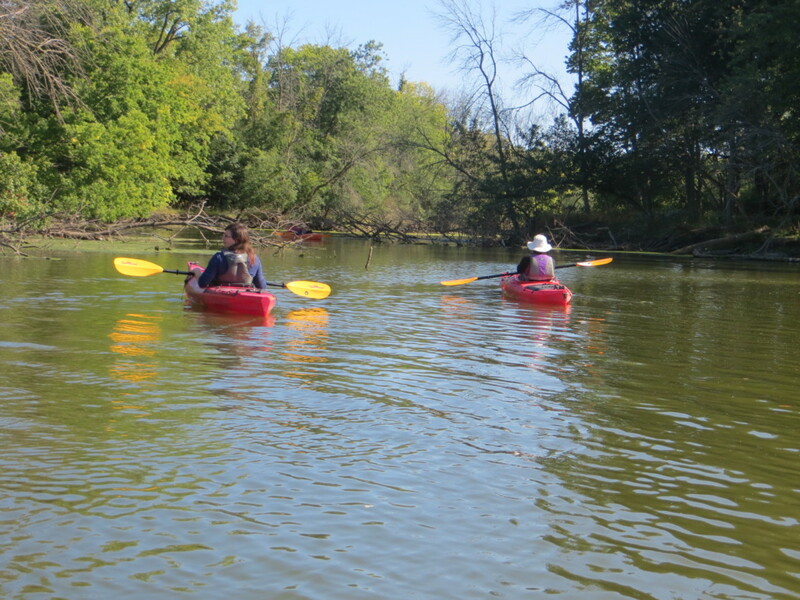 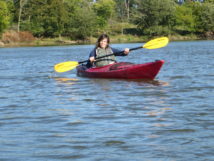 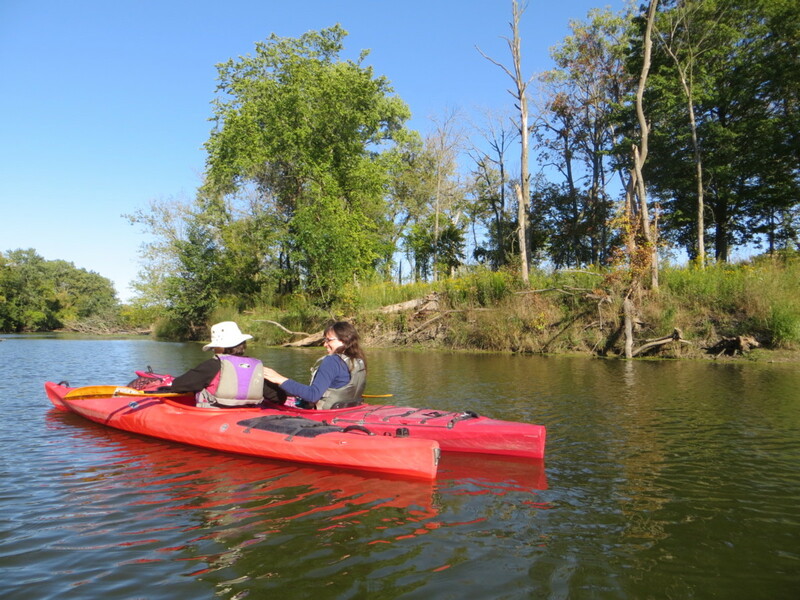 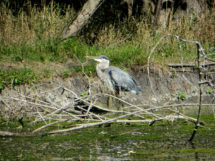 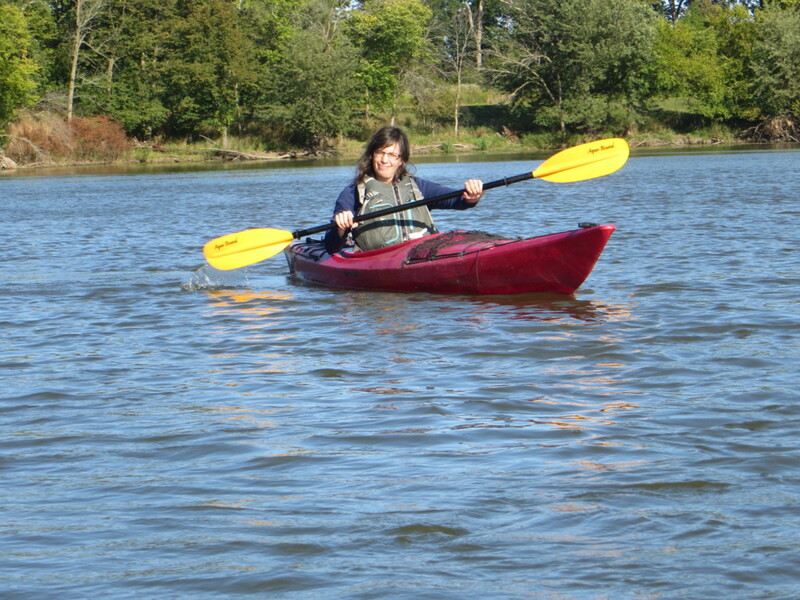 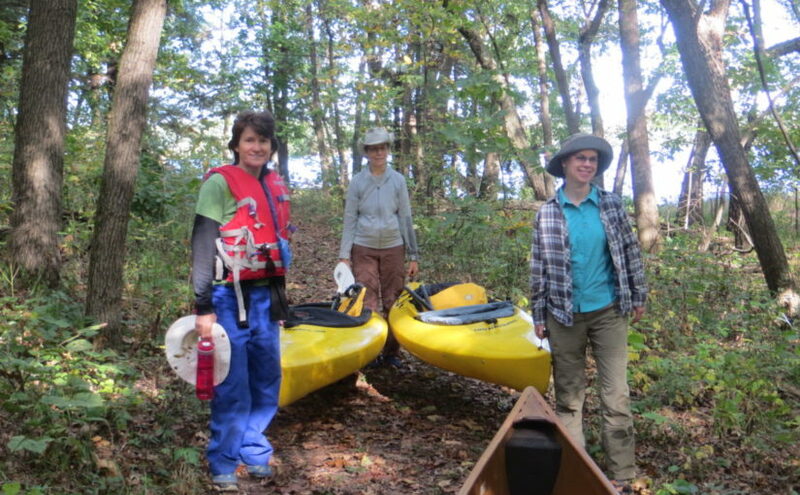 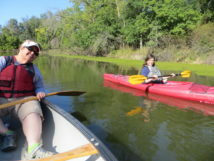 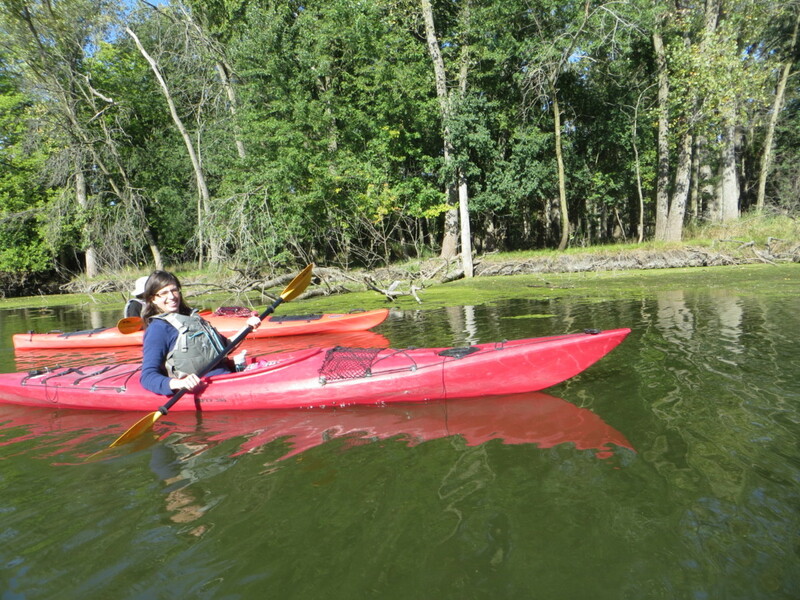 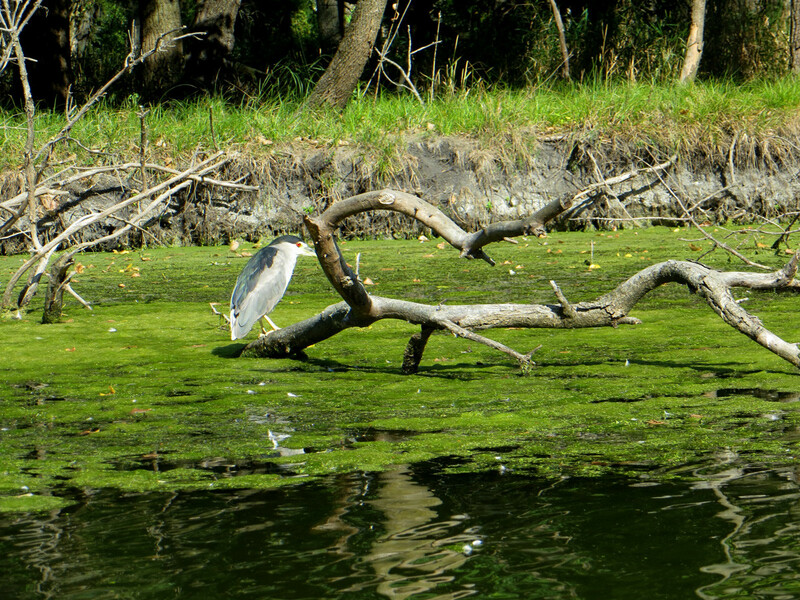 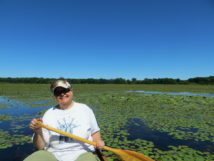 Deb’s sister-in-law declared a goal to paddle the Skokie Lagoons which is north of Chicago. 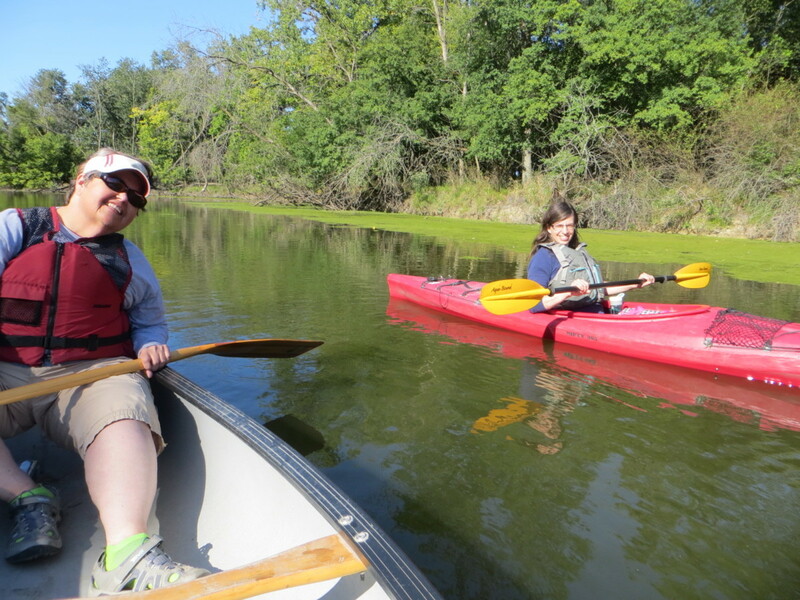 Our friends Jeanne and Katia live close by and the weekend we were driving through we decided to give it a try. 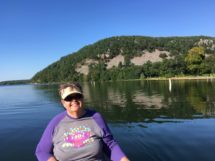 Unfortunately, my sister-in-law could not join us but we are determined to help her achieve this achievable goal. 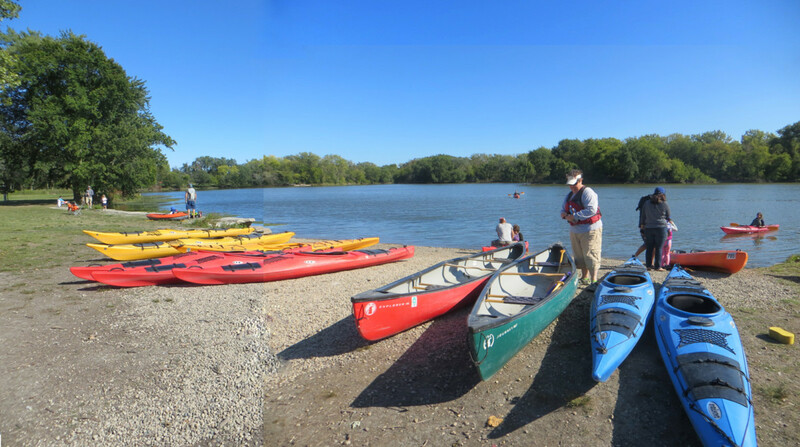 The Skokie Lagoons are not in Skokie. 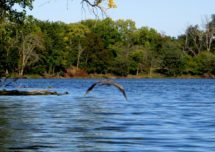 Skokie is a native american word by the way. 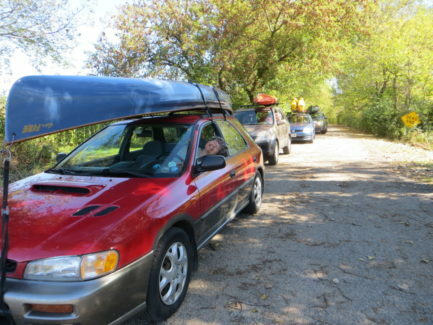 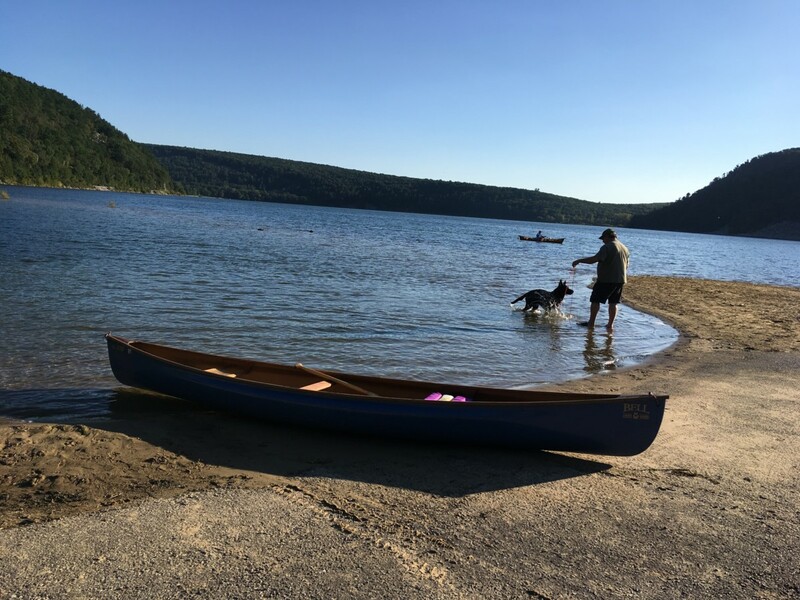 We didn’t have our canoe but we brought our own paddles and pfd’s – we rented. 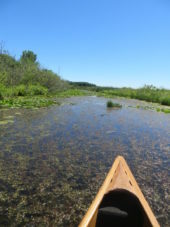 At first the canoe felt tippy but we adjusted to it and although we missed our own boat, we settled in for a fine afternoon. 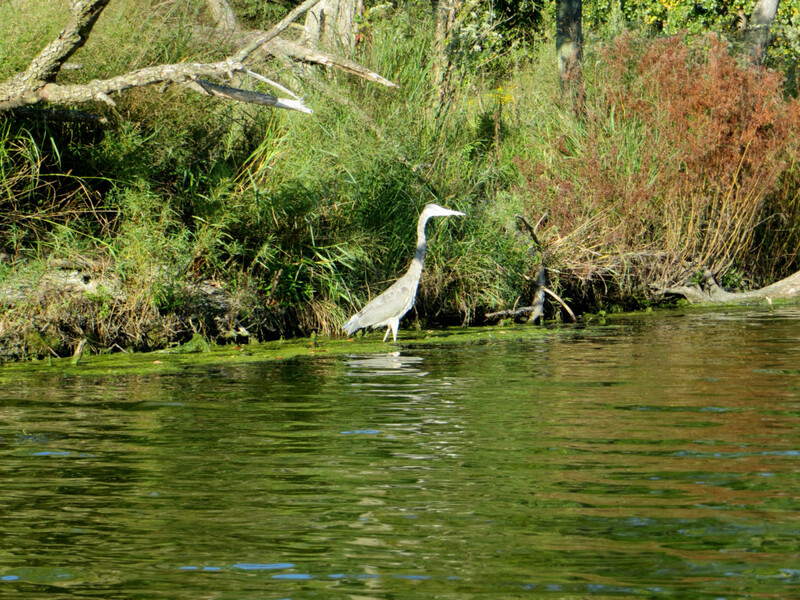 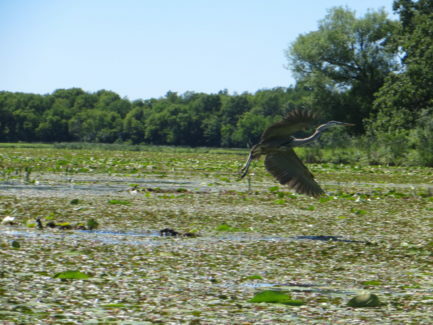 Our time was limited but we paddled 2+ hours around the first island where there were loads of heron. Next time we hope to paddle all the way to the botanic gardens; this would be helping Jeanne reach an achievable goal and we are into that. 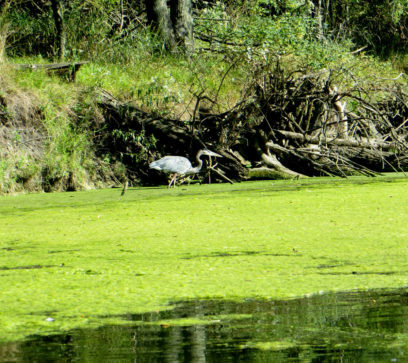 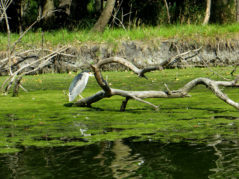 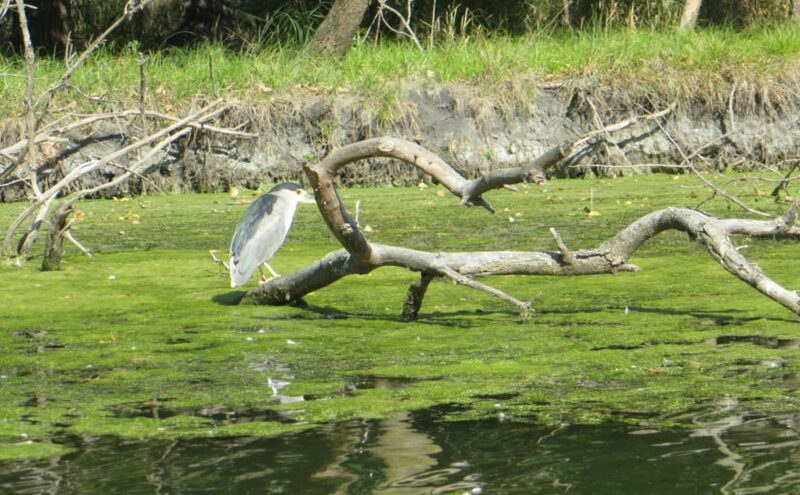 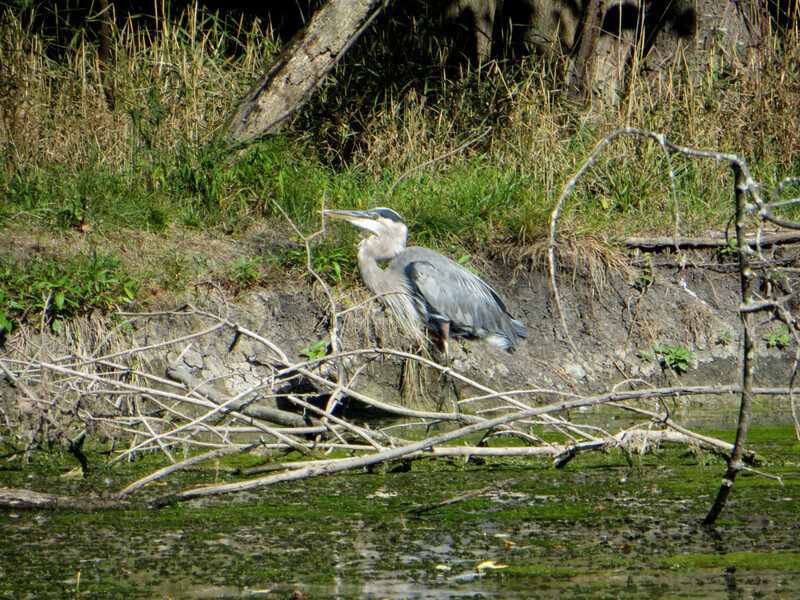 The heron on the island are so used to people that they don’t move away when approaching. 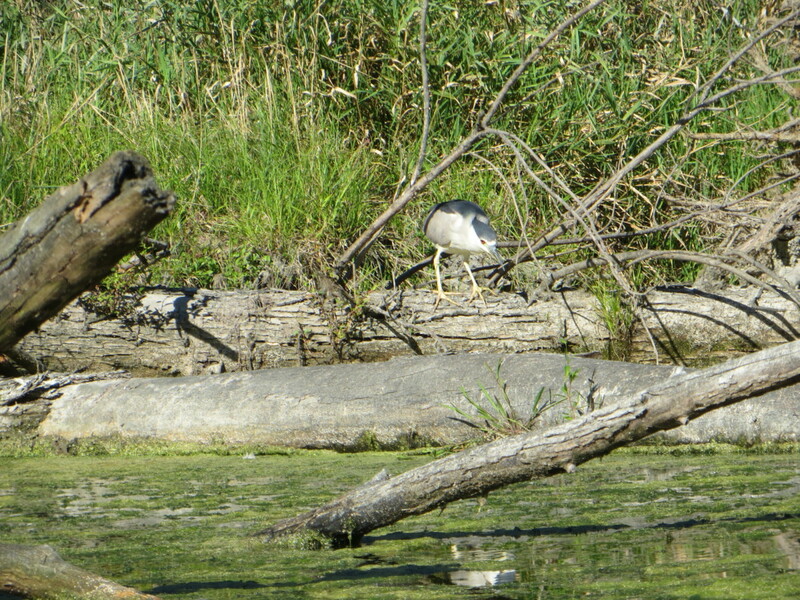 We saw great blue heron but the thrill was black-crowned night heron which is pictured at the top of this post. 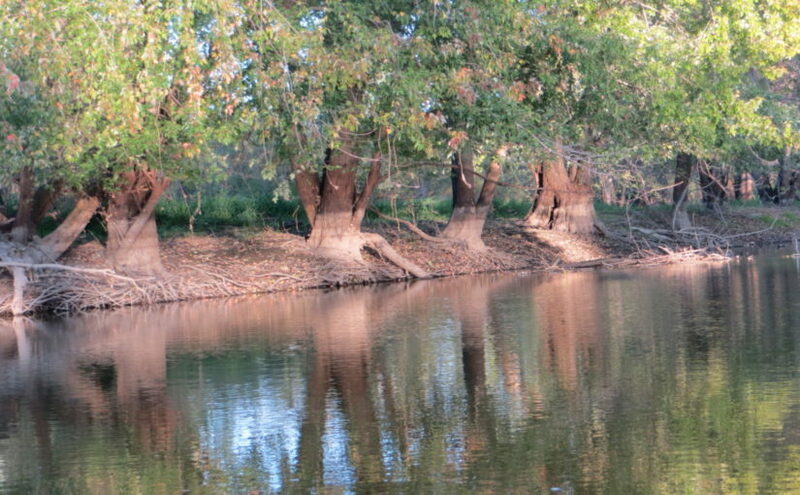 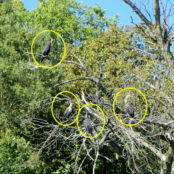 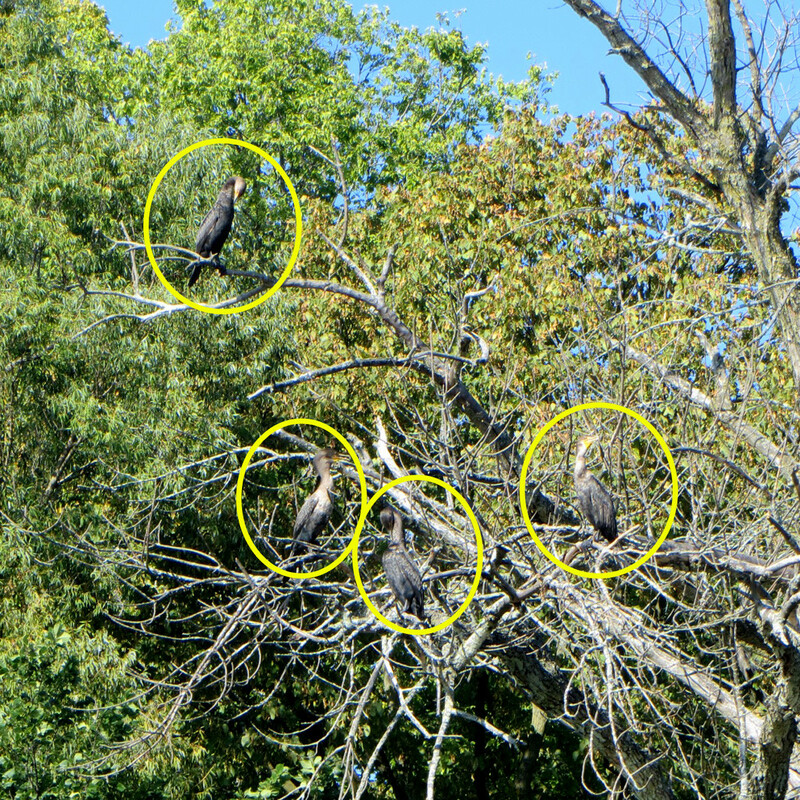 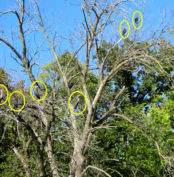 There was also a lot of cormorants and in picture you will see five or more in a tree. 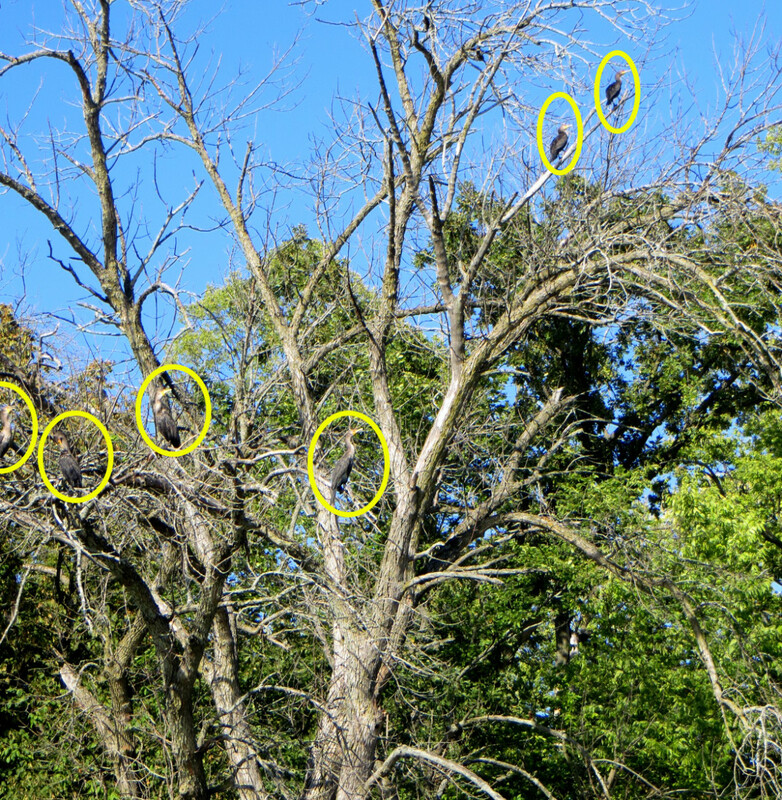 Another tree had 10+ pigeons and we were joking that that is where they go when they are not pooping on sculptures downtown. 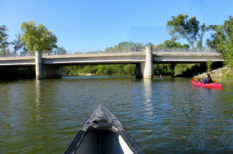 Friends who know we are not adrenaline junkies have recommended Neenah Creek to us LOL paddlers. 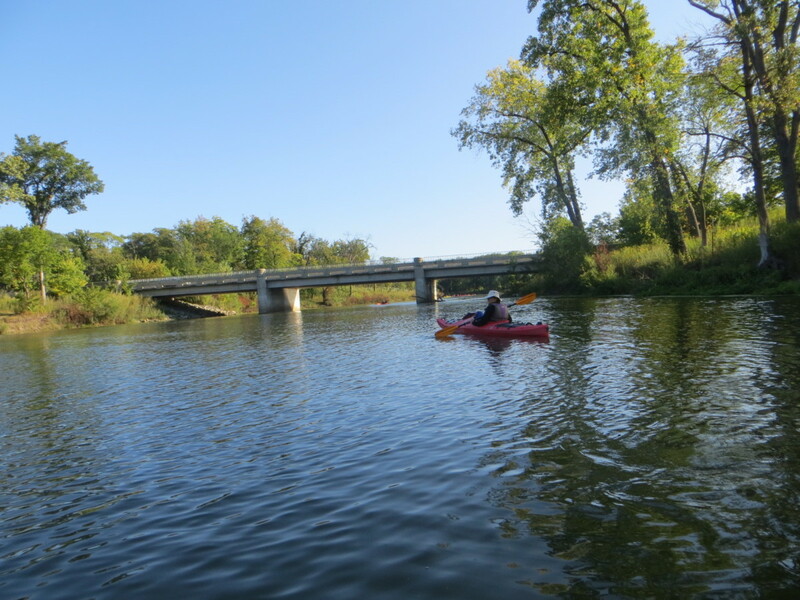 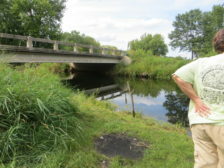 Since a number of the Neenah Creek trips posted online show riffles, rapids, rocks, logjams, ledges, culverts and wires strung across the creek, we decided to check out the creek ourselves on the way to a Tuesday afternoon paddle on the Fox River north of Portage. 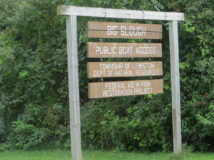 Public landing off Big Slough Rd. 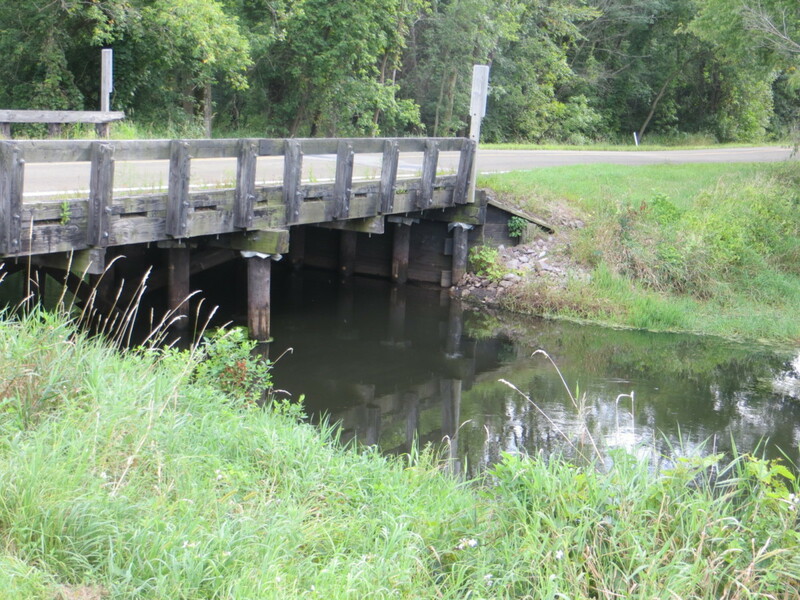 Bridge on County Rd CX. This is a fairly busy road. 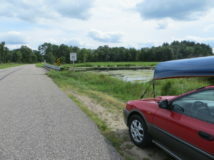 There is a pull-off area on the east side of the road, room for one or two cars. 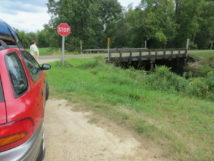 You might be tempted to drive down a few feet of crumbling asphalt and park in a flat area down by the creek bank, but you’d have to pick your route carefully and it would be unwise if muddy. 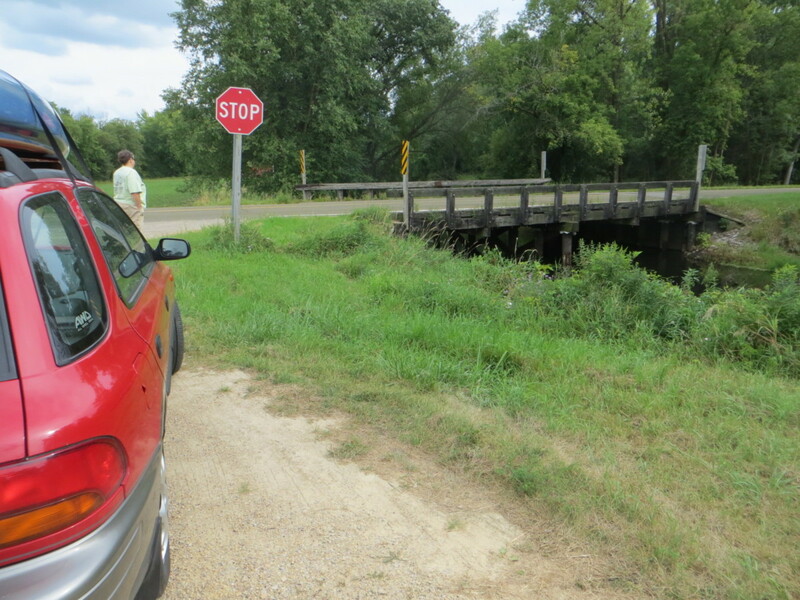 On second thought…no, just stay on the side of the road. The put-in itself looks OK, and the creek here has a nice tree canopy, no obstructions as far as we could see, with decent flow but not so swift as to prevent upstream paddling. 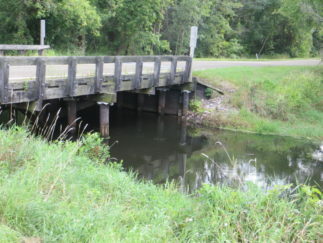 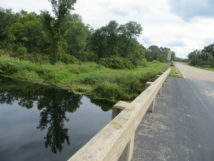 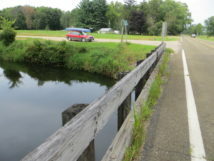 Bridge at intersection of Dixon Rd and County Rd CM. Not a landing for us! Banks too steep and overgrown. 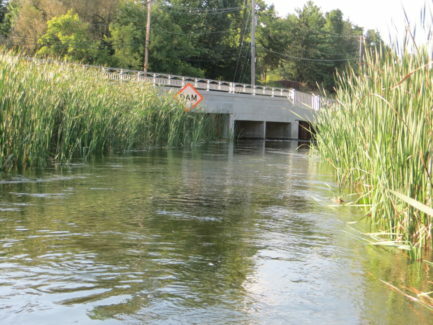 NOTE: we drove over the South Branch of Neenah Creek on 3rd Ave off Highway X. 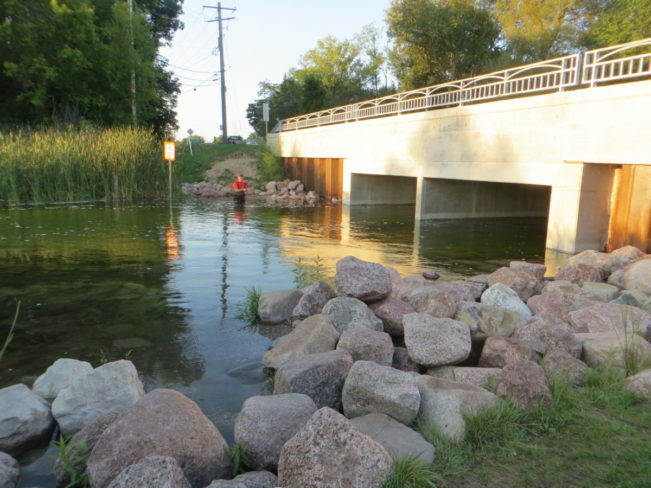 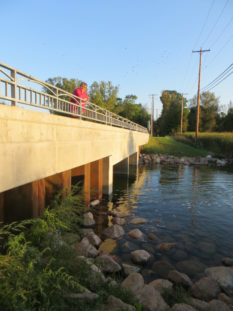 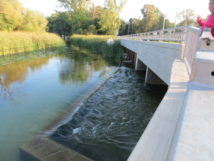 The creek runs through a large culvert, and we would probably want to avoid any route that goes through a culvert. 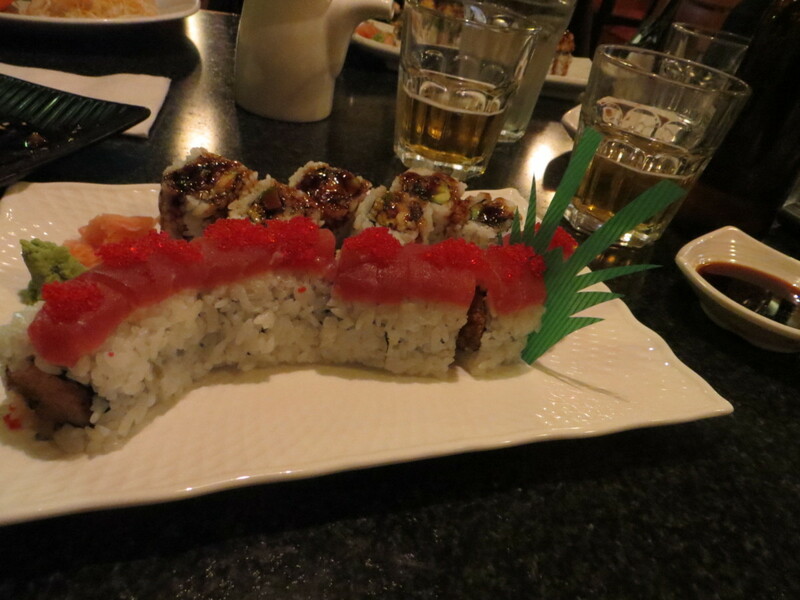 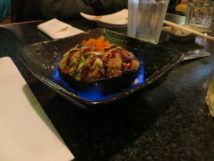 It didn’t appear to be a usable put-in or take-out in any case.